Yup! More Star Wars! While it’s true I have a ton of Star Wars stuff I want to get caught up on before Rogue One hits in a few weeks (A FEW WEEKS!!! ), the truth is I also needed something quick and easy to look at today because I’m insanely busy with work and probably will be for the rest of the year. I’m trying as hard as I can to not have to reduce the number of Features each week, but realistically, I may be cutting back to three updates a week in the near future. We’ll see. 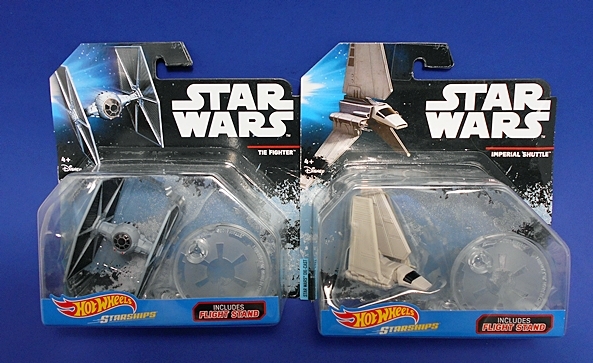 In the meantime, let’s check out a couple more Hot Wheels Starships from Star Wars! 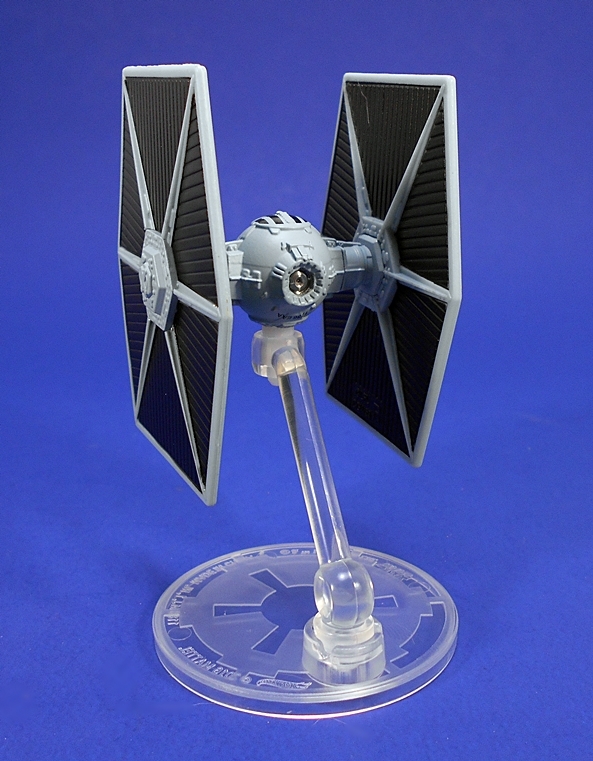 There aren’t many surprises here, but this is a beautiful little rendition of the iconic Imperial fighter. 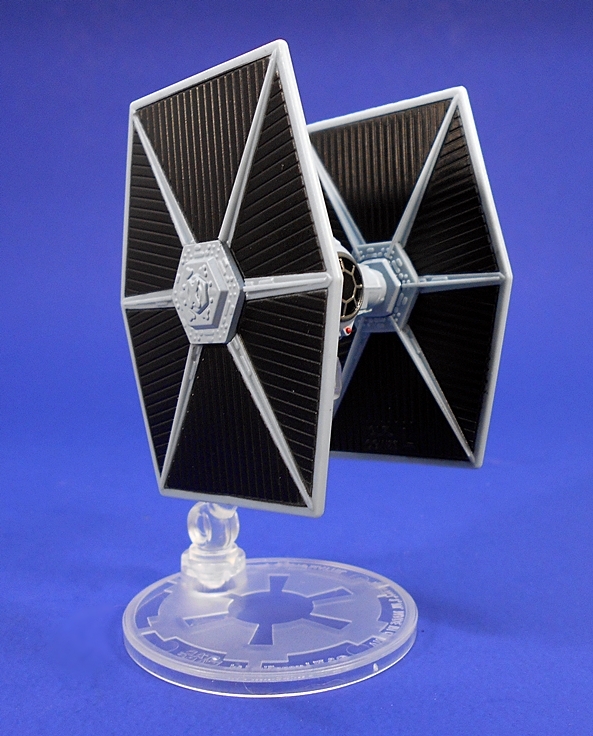 It’s also a completely new sculpt from the First Order TIE that I own. The body is die-cast and the panels are plastic, and the quality of sculpt and detail is just all around fantastic. 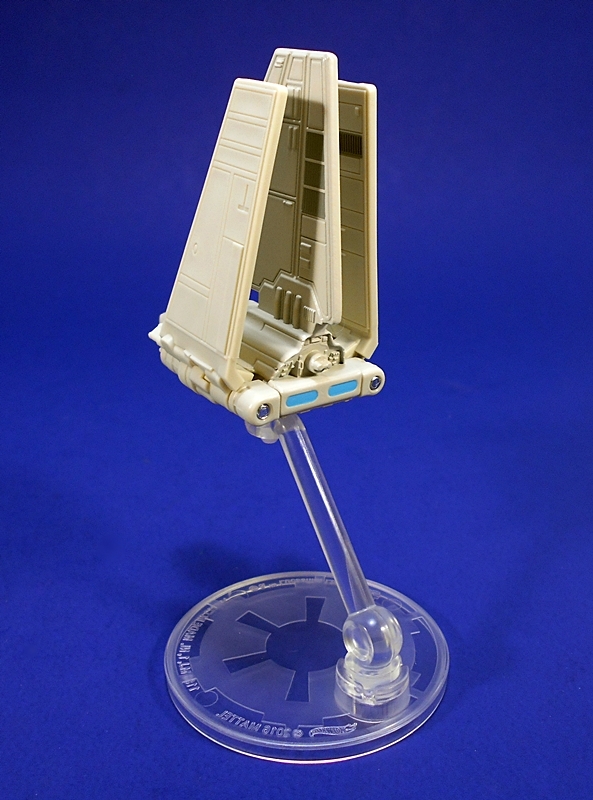 They also did a fabulous job painting the cockpit windows and framework, the black striping on the top, and the tiny red dots on the laser cannon. 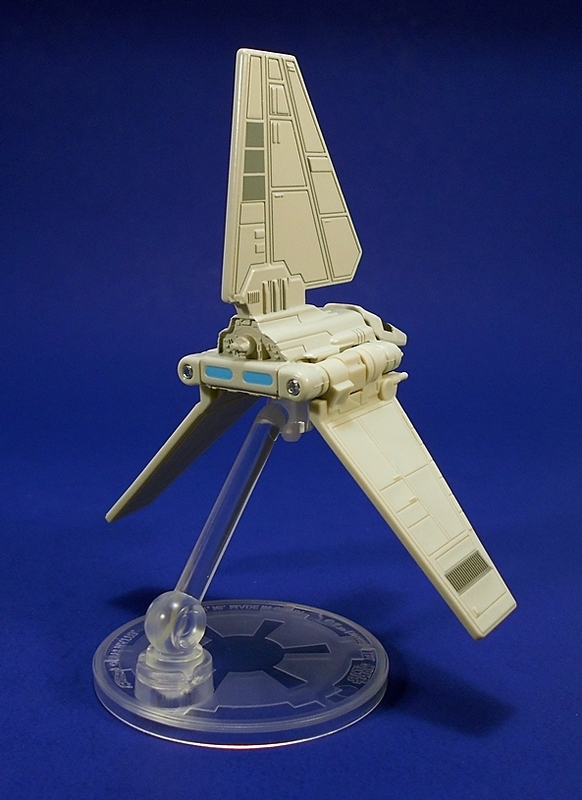 The rest of the coloring consists of the blue-gray hull and the black panels on the “wings.” My only question is, does anyone know if Mattel issued a white version, because I’d love to pick up one of those too. 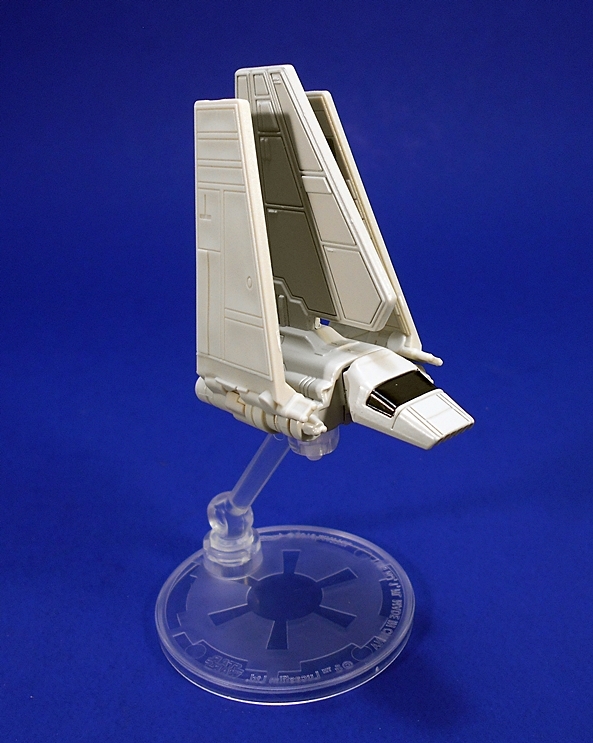 Next up is the Imperial Shuttle, one of my favorite ship designs from The Original Trilogy. 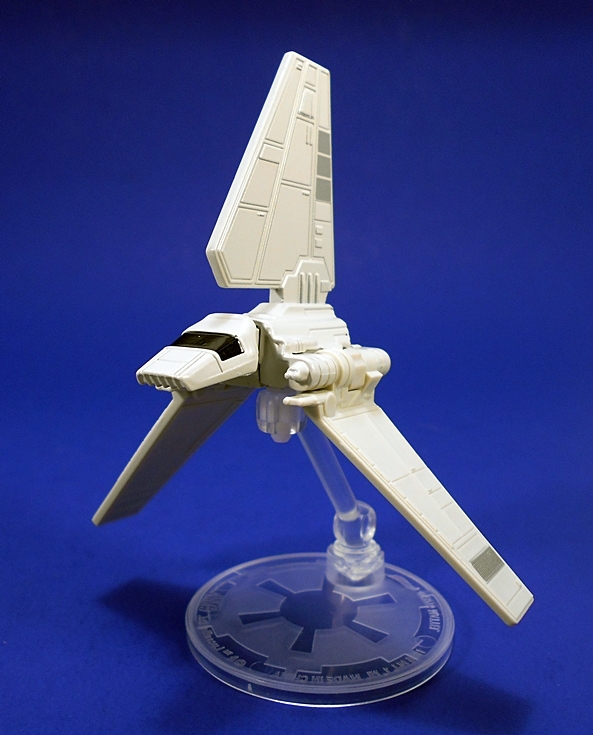 One of these days I need to get around to reviewing Hasbro’s re-issue of the Kenner 3 3/4-inch version of this ship! This one may be tiny, but it captures the look of the design perfectly in this scale. The body and central fin are all die-cast, with only the wings being plastic, and yes, the wings are articulated so you can display the ship landing or in flight. The shuttle does not sport much in the way of paint. 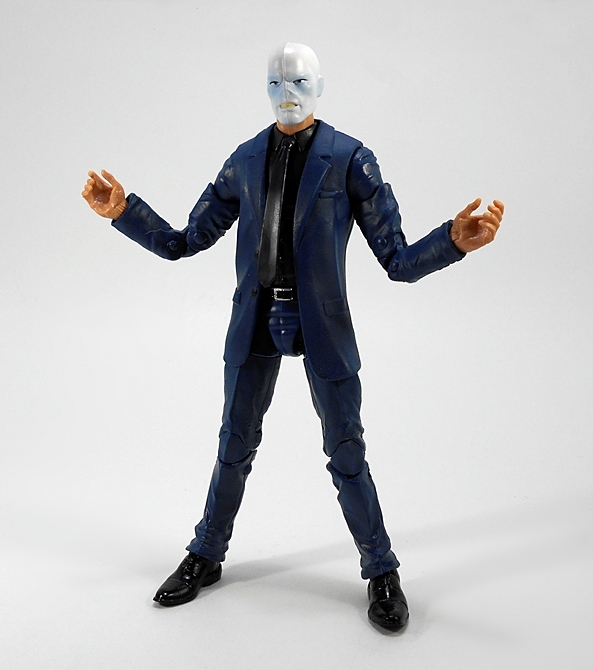 Mattel went for a very clean and new look here. 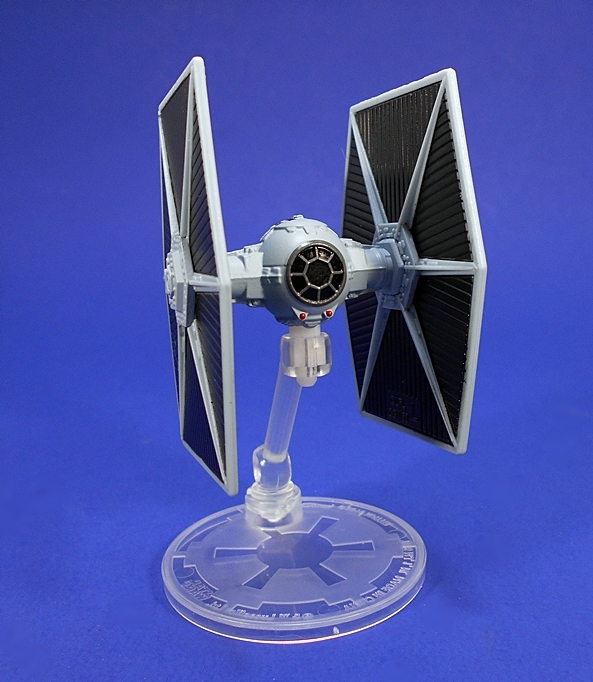 You do get some gray panels on the wings and fin, blue paint on the rear thrusters, and black paint on the cockpit screen. There are also plenty of great little details and panel lines sculpted into the hull. I would have liked a bit of gray paint on the wing guns, but it’s still a nice looking ship. 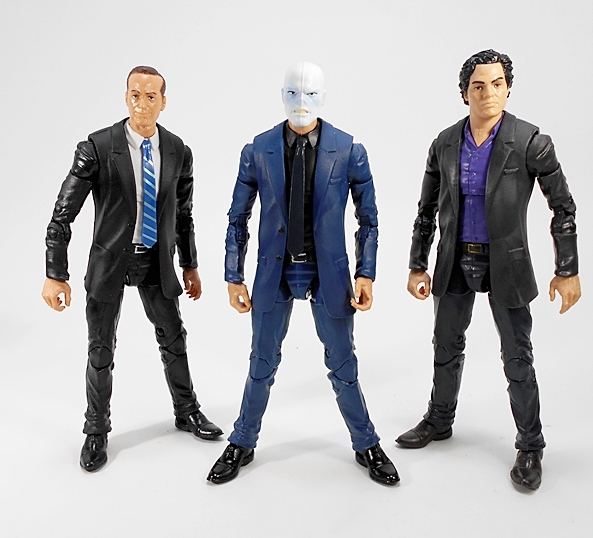 If you’ve been collecting this line from the beginning, you’ll note the change in stand designs. Gone are the ones designed to go on your finger and in their place are these clear discs with the Imperial insignia sculpted in. I liked the old style well enough. They were fun and innovative, but I think these just look better. Unfortunately, the fact that the stands don’t match on all my little ships is making my OCD flare up. While my attention to this line has been spotty at best here on FFZ, I continue to enjoy collecting these a lot. I picked up this pair for under five bucks a pop and I still think these are some of the best values in the toy aisles today. 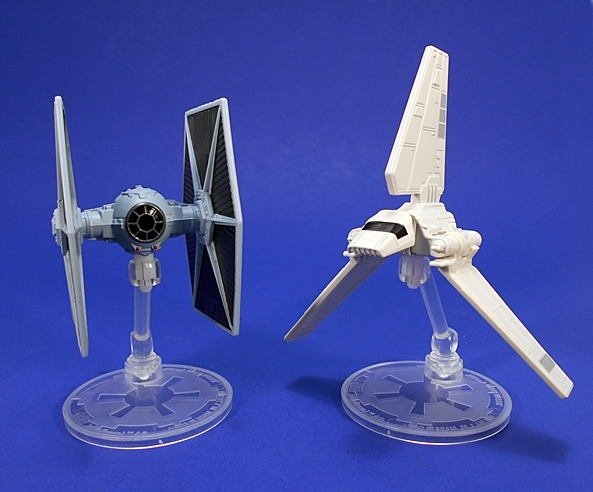 They’re fun, they look great, and I can amass a whole fleet of them without breaking the bank. I kind of think of these as the modern equivalent of those cheap rack toys I used to buy with my allowance at the corner drug store when I was a kid. The only difference being that these are a whole lot better quality. I feel sorry for Christmas this year, because it’s competing with Rogue One and I know which I’m looking forward to more than the other! In fact, going to see that will be the only thing that gets me anywhere near a shopping mall this December. While Hasbro hasn’t exactly flooded the shelves with new merchandise, we have had a couple of 3 3/4-inch and 6-inch waves of figures. 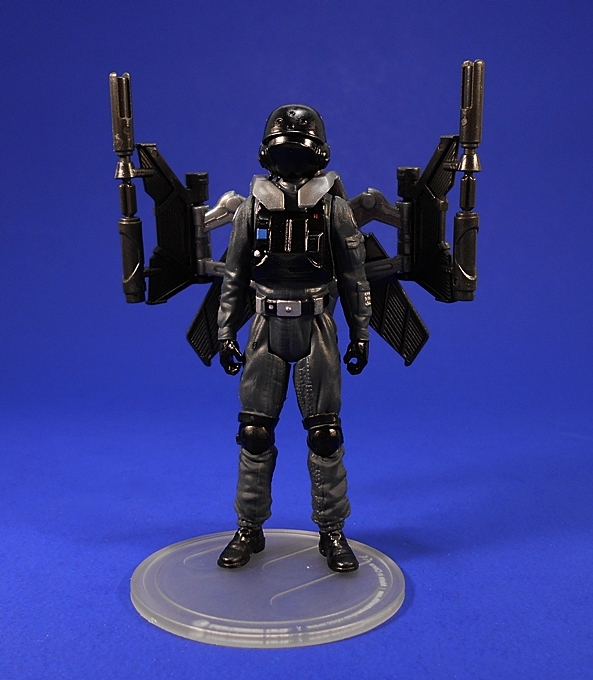 One of the more sought after figures in the 6-inch Black Series so far has been this Toys R Us Exclusive Imperial Hovercraft Pilot. 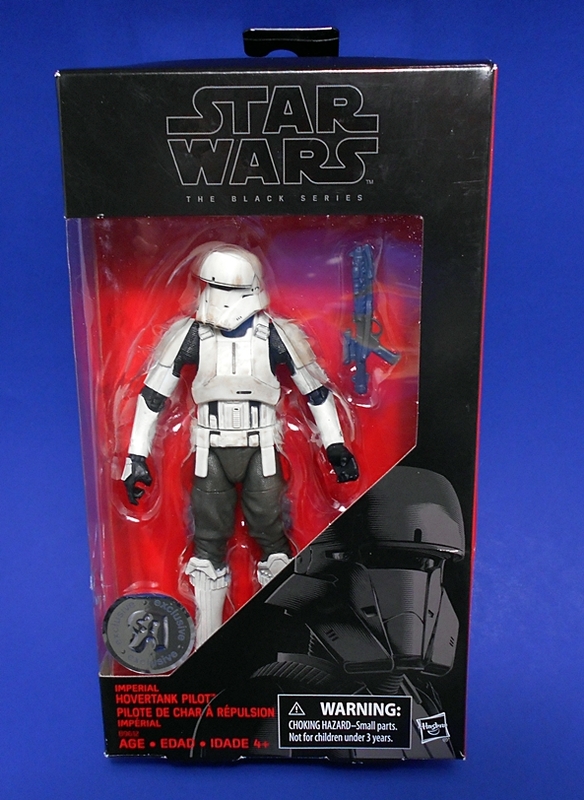 It was in short supply on Force Friday, but now it seems to be hitting with a lot more regularity. Hey, if I can get a TRU Exclusive, you know it ain’t that hard to get! The figure comes in the typical Black Series window box with no specific branding to the Rogue One film. There’s only a couple things worth pointing out on the package. One is the TRU Exclusive sticker on the lower part of the window. The other is the fact that the figure isn’t numbered on the side panel. 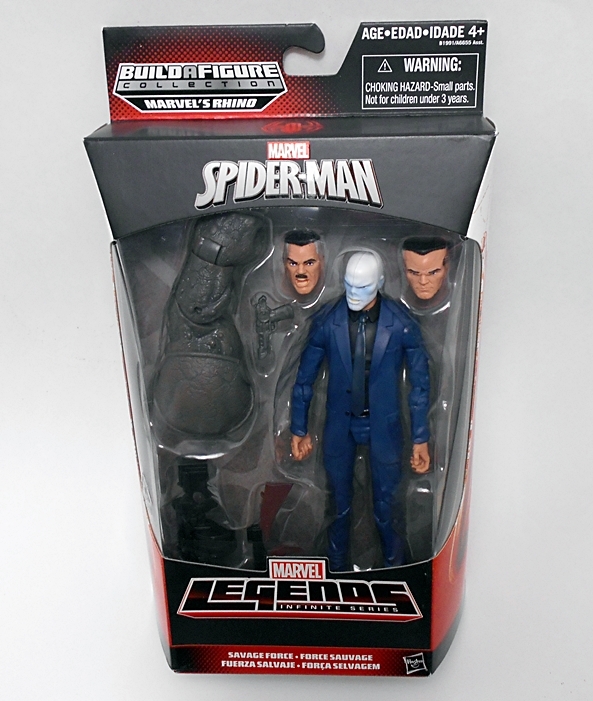 So far, Hasbro has been skipping the exclusives when it comes to the numbered series. I really enjoy the way this packaging has evolved with the snappy red background and the larger piece of character art. I don’t generally tend to keep my Black Series packaging, but I will probably make an exception here, just because he’s an exclusive. Out of the package, this is one damn cool looking figure. 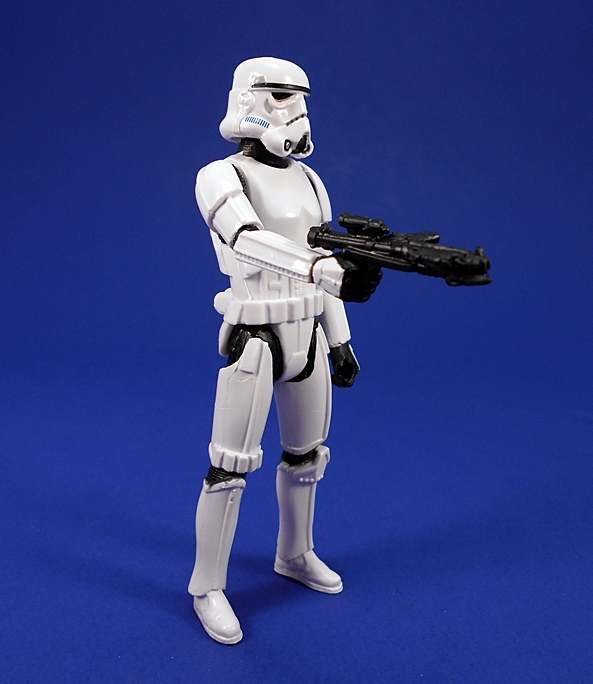 The blurb on the box points out that he has lighter armor than your average Stormtrooper because he drives an armored Repulsor Tank. While technically his armor is lighter, what’s really only missing is the area from his knees to his waist. Maybe that makes it more comfortable for him to sit. I can understand the armor on his top half, if he spends time popping out of the hatch, and I suppose the lower leg armor is akin to just fortified boots. Still, if I’m going into battle, I’d rather my crotch not be the only thing that’s not armored. It’s probably best not to over think these things. Especially with this guy, because I really love this design. 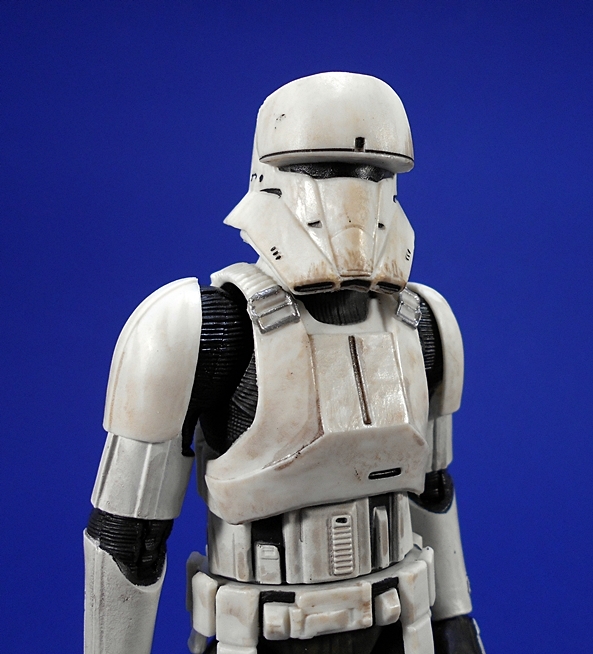 The armor on his arms, mid-section, and belt are very evocative of your more traditional Imperial troop armor. 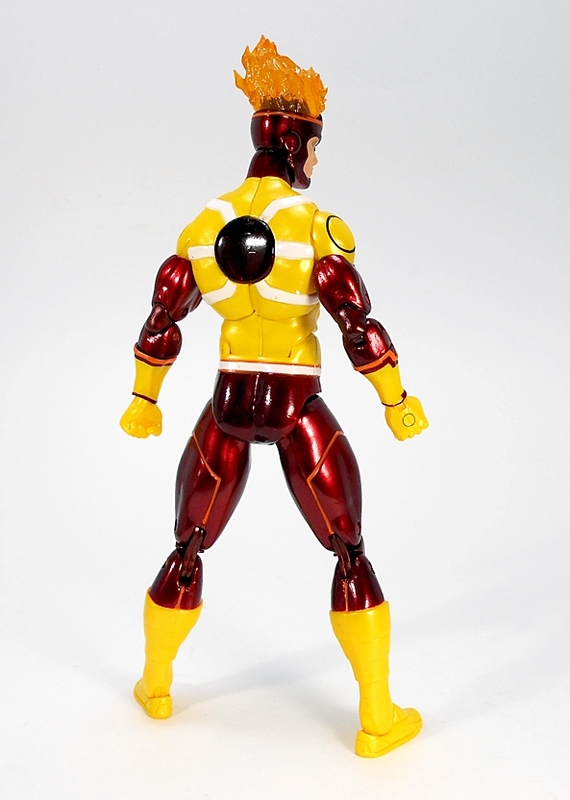 The chest and back plates are different, with a more deliberate look to the sculpt on the front and a vented integral backpack on the back. I like the sculpted straps that connect his chest piece and back plate. All of the armor plates on this guy are colored off-white with an effective paint wash that makes him look nice and grungy. 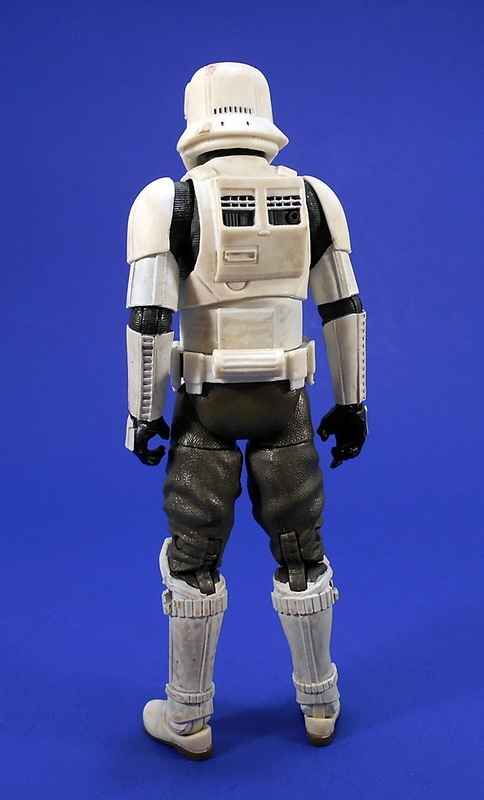 The exposed under garment between the armor is pretty typical of regular Stomtroopers, but his exposed trousers are brown. He retains that familiar “bed-roll” tube on the back of his belt. I really dig the helmet design on this guy. 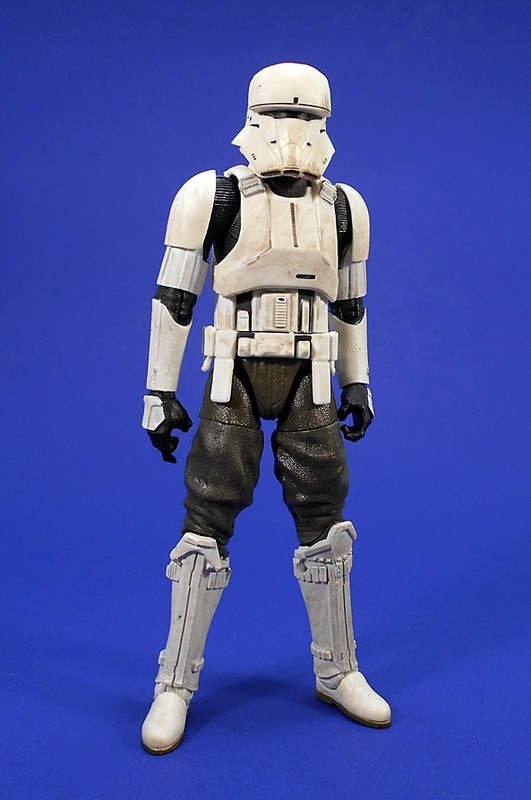 While the Death Trooper helmet looks a little kit-bashy to me, this one stands out as pretty unique and distinctive. 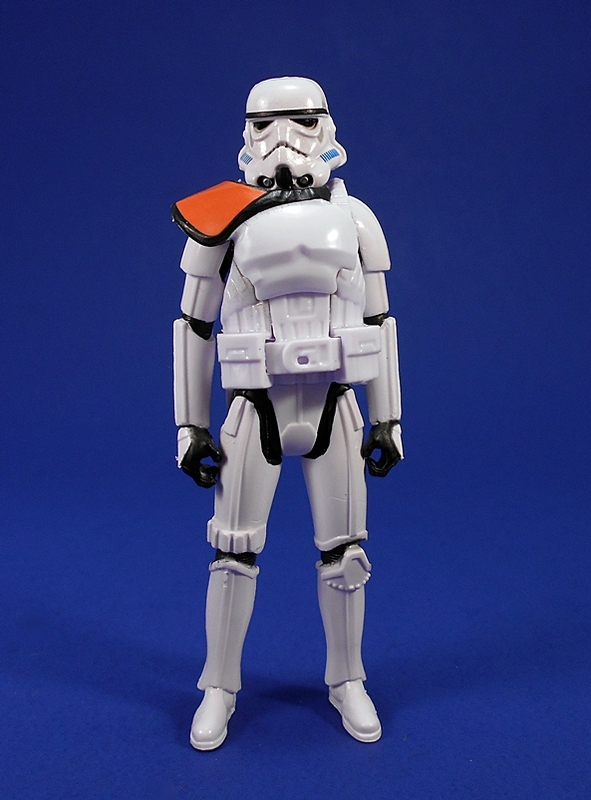 The only thing I really find familiar is the slit visor, which reminds me a little bit of the First Order Snowtroopers and Flametroopers. 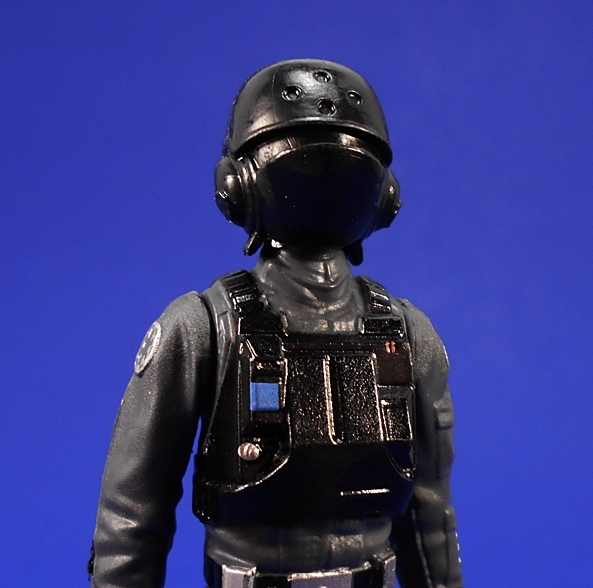 The pronounced plate above his visor looks like it might be designed to articulate downward and shield his face on the costume, but it is sculpted in place on this figure. 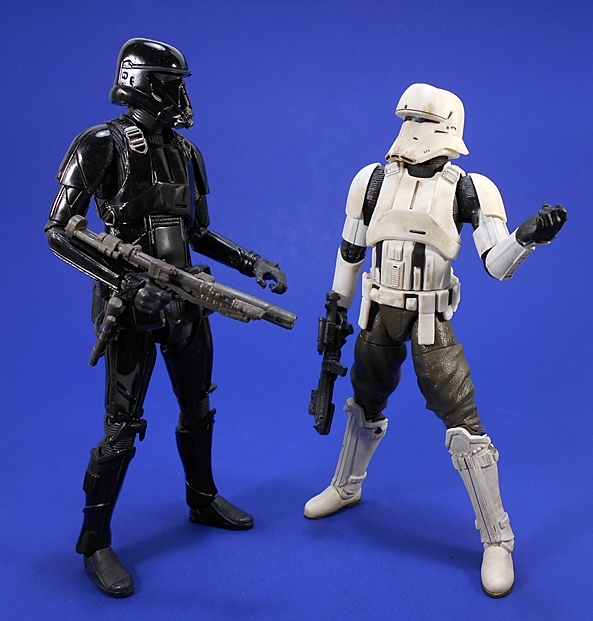 The points of articulation here are very similar to what we got with most of the 6-inch Black Series troopers, although with a little less armor, some of those points feel like they have a greater range of motion. The arms have rotating hinges in the shoulders, elbows, and wrists. The legs are ball jointed at the hips, with swivels in the thighs and double hinges in the knees. The ankles are hinged and have lateral rockers. There’s a swivel in the waist and a ball joint just under the chest. His neck has both a ball joint and a hinge. The joints on this guy feel great and he’s a lot of fun to play around with. The Hovertank driver comes with a pretty typical E-11 Blaster. It’s a little soft, but still a nice sculpt. 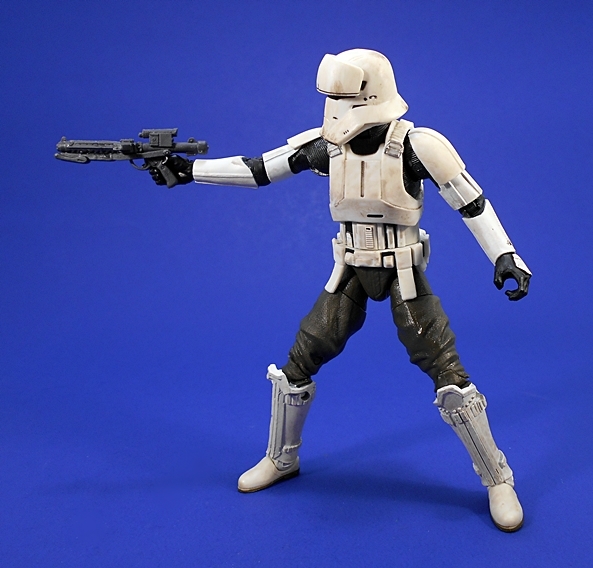 He doesn’t have a holster or clip for it, but I guess he probably just stows it in the driver’s compartment of the vehicle when he’s not using it to shoot rebel scum. While I was able to get this guy at regular retail price, I have to say that I would have been perfectly fine with having to pay more if I had to. He really is that good. In fact, If there’s any downside to this figure for me, it’s that he’s a driver for a vehicle we will most certainly never get. 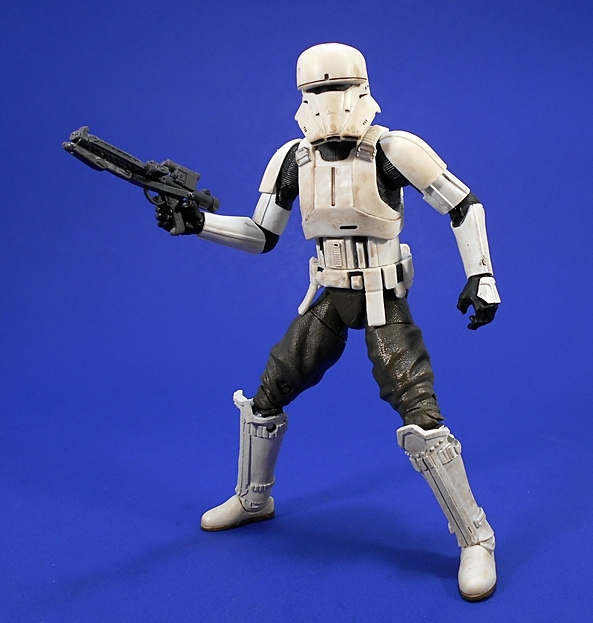 He’s such a cool design and so wonderfully executed, I’d love to have him as some kind of specialist infantry so he can hang out with the rest of my Imperial troops and see more action on foot. 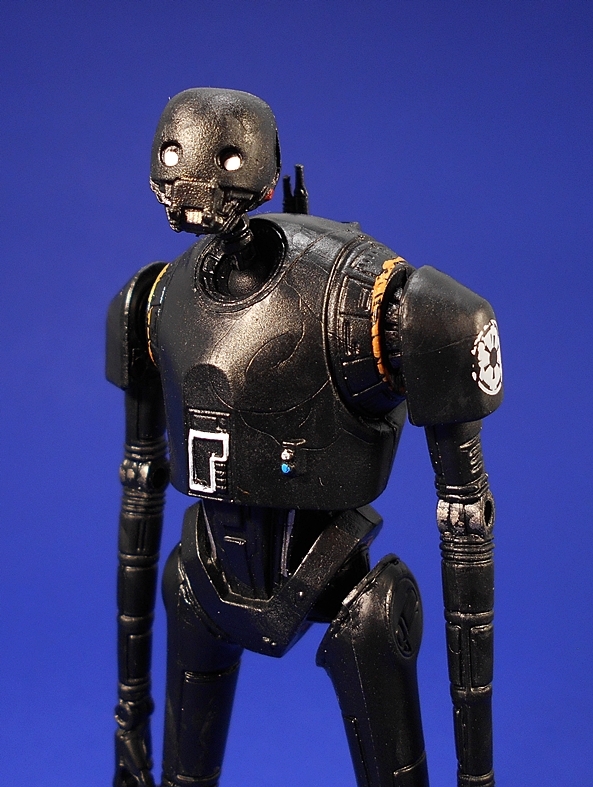 With that having been said, this figure represents one of my favorite new Imperial designs to come out of Rogue One so far, and likewise, he’s definitely my favorite Rogue One figure in the 6-inch Black Series. I’m back from my little post-Thanksgiving hiatus. The turkey has been gobbled and I’ve worked a lot of hours, but it’s time to get back in the saddle again on this wonderful Marvel Monday. 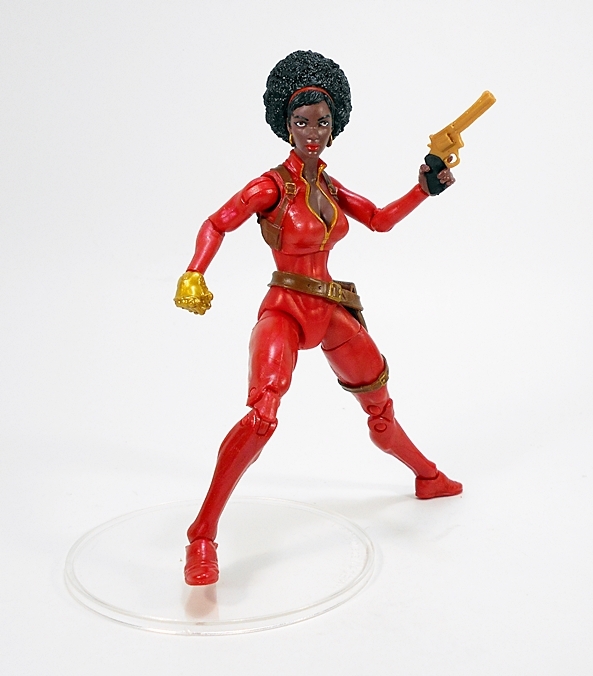 I’m coming into the final stretch with my unfashionably late look at the Marvel Legends Rhino Wave, so let’s jump right in and have a look at Misty Knight! 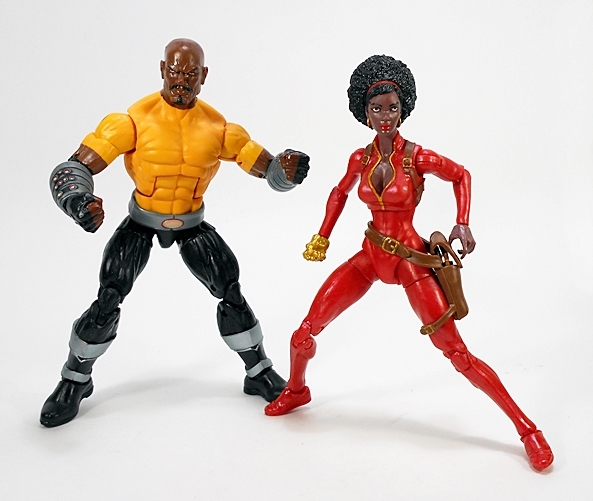 You get the same old packaging and Misty shares the “Heroes For Hire” slot with Ghost Rider, who I looked at a few weeks back. Misty was a peg warmer around these parts, which is ironic because she was one of my most anticipated figures in this wave. Not only has a version of the character gotten a lot of screen time in Netflix’s Luke Cage series. But more importantly, she was prominently featured in alongside Valkyrie in The Fearless Defenders, a comic run that I enjoyed quite a bit. 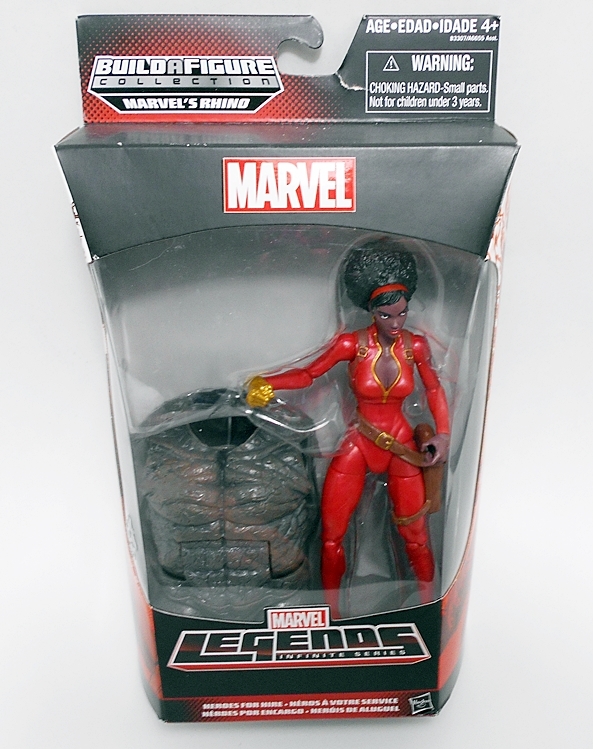 And it’s pretty cool that Hasbro has hit a lot of the gals in that lineup with Marvel Legends lately. And isn’t she lovely! Misty’s buck features a mostly featureless body suit, showing off some sculpted muscle definition in her abs, a plunging neckline with gold piping, and a high collar. She also has a sculpted shoulder rig with armpit pouches… ARMPIT POUCHES!!! Even Deadpool, Lord of the Pouch, never thought to wear armpit pouches! She also has a belt that rests on her right hip and plunges down to a low slung holster on her left hip, complete with thigh strap. And like a lot of the Legends ladies, she’s got a fine caboose! In terms of sculpt, this design strikes a really nice balance between plain buck, new sculpting, and some added bits. The red plastic used for the body suit has a nice, subtle metallic sheen, the straps and belts are all brown, and the gold paint is applied very neatly even on the tiny buckles. 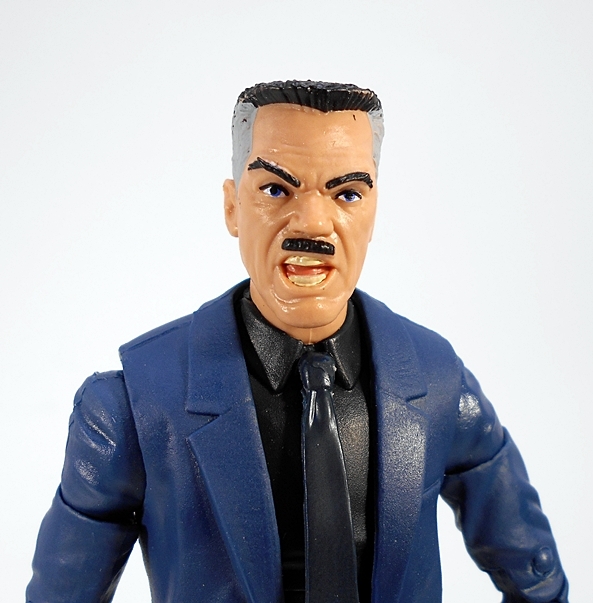 The sculpt on the portrait here is fantastic, even if the paint has a few flubs. The eyes on my figure are a bit askew, and there’s a chip on the paint on the back of her head. It’s nothing I can’t fix with a little Sharpie action, but I shouldn’t have to. 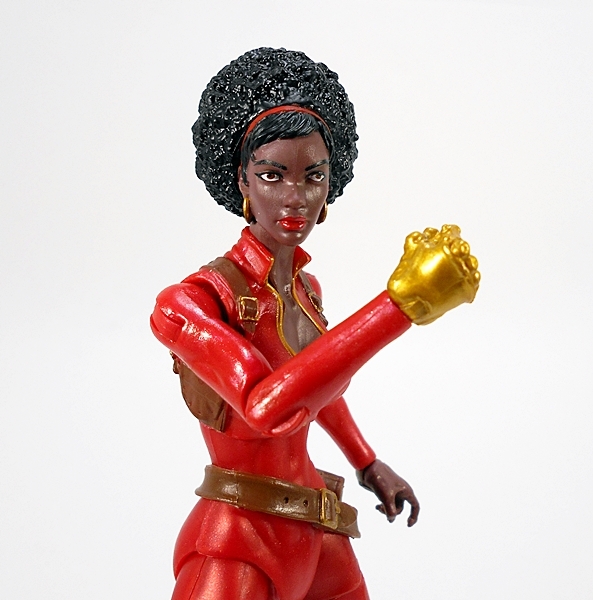 Either way, she’s got a beautiful face and the epic 70’s style afro that spills out behind the red headband is superb. The gold painted hoop earrings are a nice touch too! And speaking of gold, Misty is sporting her cybernetic arm from Stark Industries. Only the hand is exposed, but it’s a cool little sculpt and has some more of that nice gold paint. The articulation here is in line with most of the modern females we’ve been getting. Sadly, that means the arms lack bicep swivels. They do, however, have rotating hinges in the shoulders, elbows, and wrists. The legs are ball jointed at the hips, with swivels in the thighs and double hinges in the knees. The holster strap does restrict the left thigh swivel a bit. The ankles are hinged and have lateral rockers. 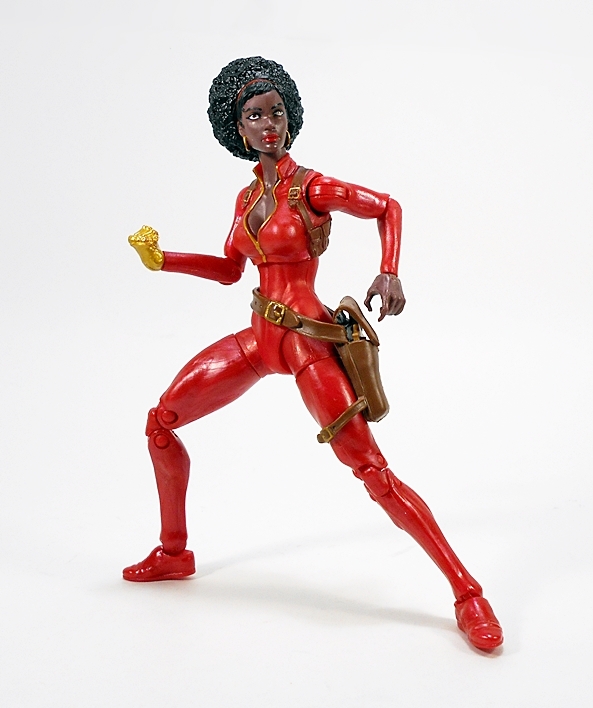 There is no waist swivel, but she does have a ball joint just under her chest and both a ball joint and hinge in the neck. Misty can be a little daunting to keep standing up, which makes me doubly thankful they didn’t give her heels. 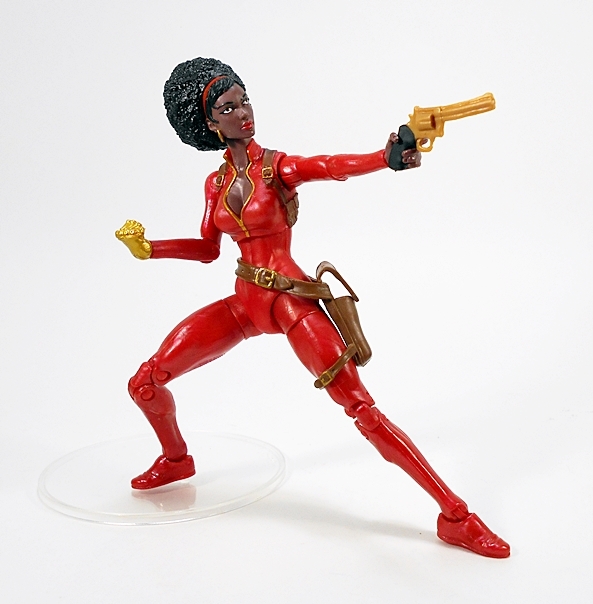 Misty comes with one accessory and that’s her gold revolver. I’m not a big fan of this piece. 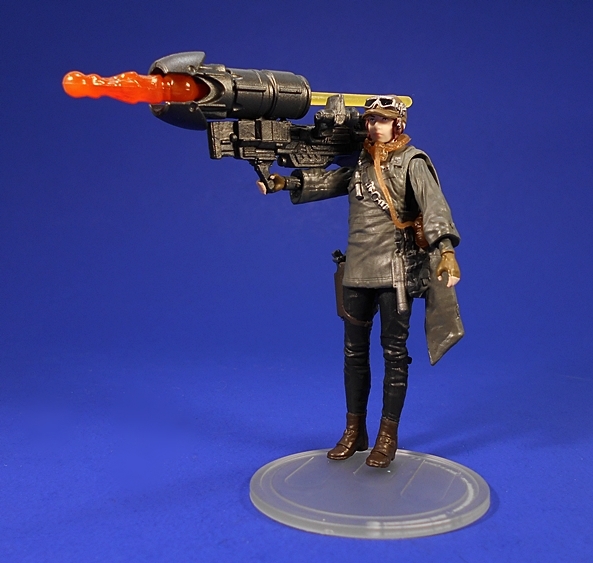 The sculpt isn’t very detailed, the barrel tends to warp, and the matte gold plastic used for most of it just doesn’t look that good. It does, however, fit nicely in her hip holster and she can hold it in her left hand. 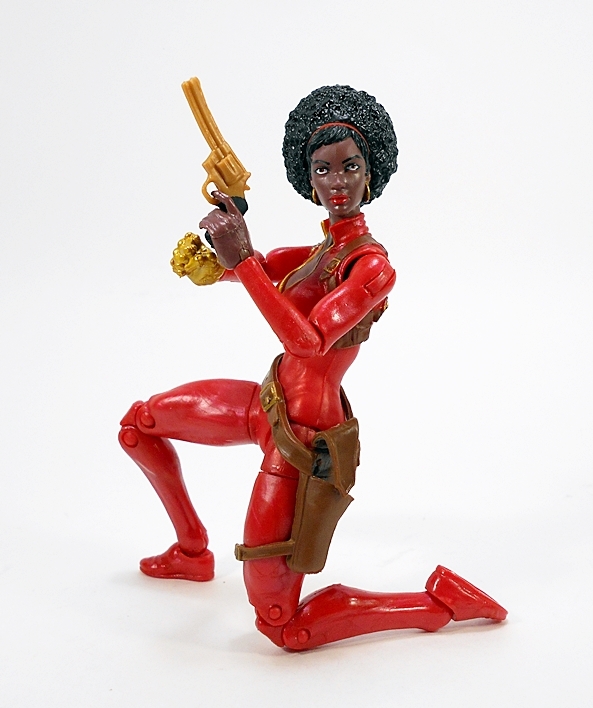 Despite a few hiccups on paint and a crappy gun, I’m very happy to have this lady in my collection. 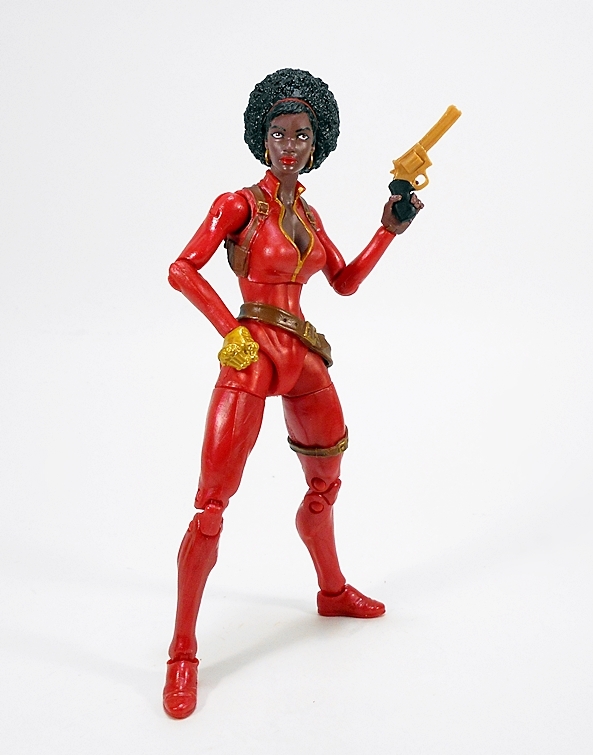 In fact just seeing an action figure like Misty, oozing that 70’s funk and swinging on the pegs in the toy aisle makes me happy. I just wish there weren’t so many Mistys swinging on those pegs, because that suggests she didn’t sell well. And that makes me sad. …I’m taking the rest of the week off! Last year, I was able to muddle through this week with content as usual, but I decided that in the interest of my sanity, I wasn’t going to attempt it this year. For the next couple of days I’ll be crazy busy with work and travel obligations, and hopefully get to do some festive eating. Nonetheless, I just wanted to pop in today to say how thankful I am for everyone who continues to read my silly little toy blog. I’m thankful for all the cool people I meet doing this and new friends I’ve made, especially on Twitter. And I’m also thankful that I’m blessed enough to live a lifestyle that allows me to pursue a hobby as frivolous as collecting and writing about toys. That’s all I’ve got for today. I wish you all a Happy Holiday, and I hope to see you back here in a few days for Marvel Monday! 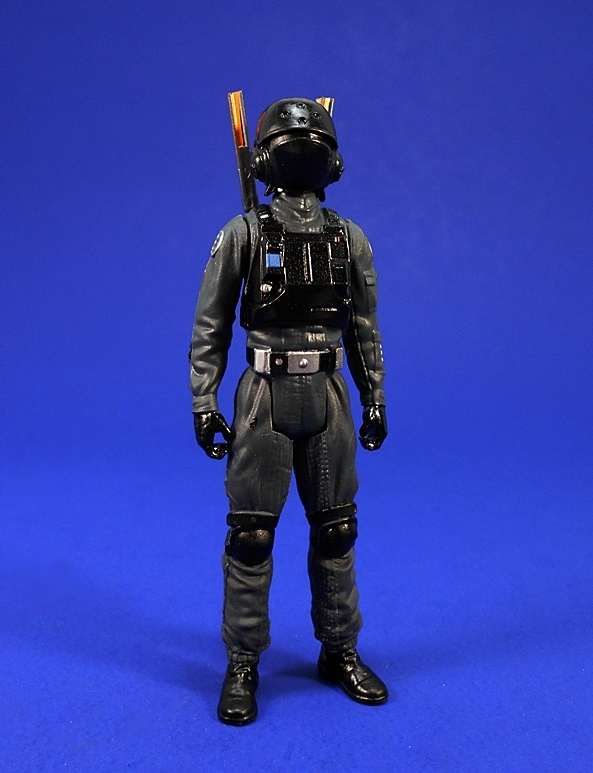 As promised, I’m back today with a look at some more of Hasbro’s 3 3/4-inch Rogue One figures. Yesterday, I tackled the first half of the initial wave with Jyn Erso and K-2SO, and today I’m having a look at the Imperial Stormtrooper and the Imperial Ground Crew. And look! This time I didn’t forget to take a packaged shot before ripping them open! Once again we get some lovely character art beside the bubbles and the Rogue One Death Trooper branding on the top, right corners of the cards. He is clearly pleased that I have added two new Imperials to my collection. The backs of these cards feature short blurbs about the characters and a multi-lingual soup of text. The annoying mission themed categories of The Force Awakens line are gone as are the Build-A-Weapon parts. 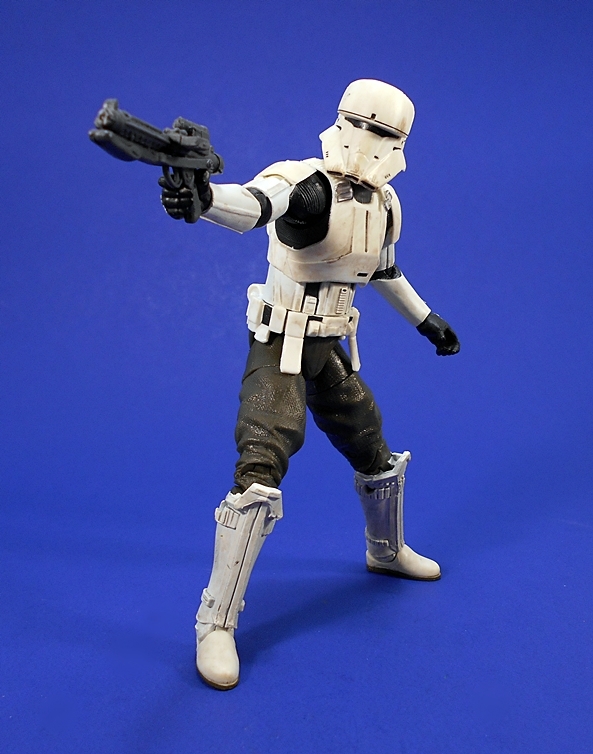 Let’s start with the Stormtrooper! 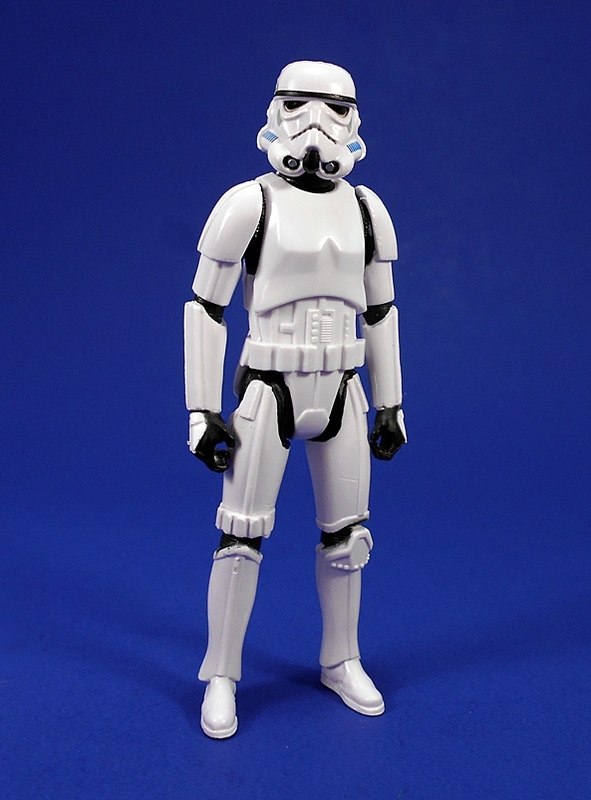 What can I possibly have to say about yet another 3 3/4-inch Stormtrooper? Well, mainly that this is a fantastic little figure. The sculpt is sharp, the paint is clean, the plastic is nice and glossy, and he just looks amazing. And given that he’s just five points of articulation, he can stand with total stability and ram-rod straight, making him perfect for those huge Imperial processions we all fantasize about displaying. 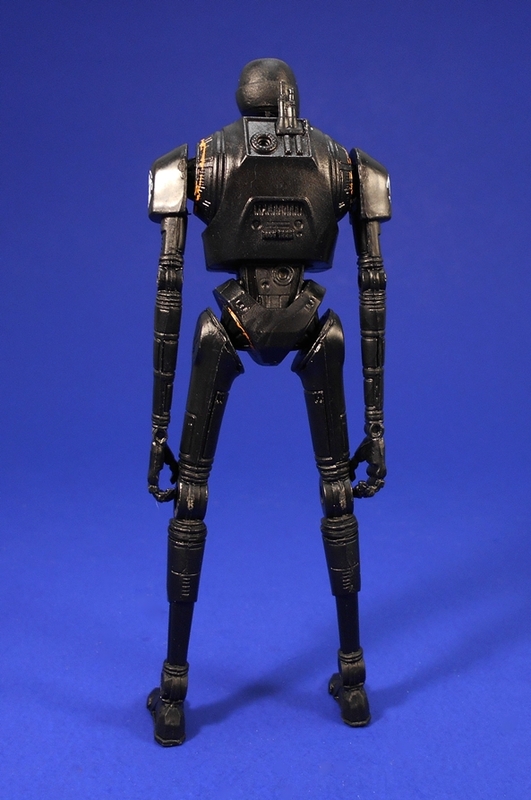 I could easily see setting up a display by lining up dozens of these figures and peppering in some of the super-articulated modern Stormies for a little variety. In short, I adore this figure. And I will definitely be on the hunt for some more. 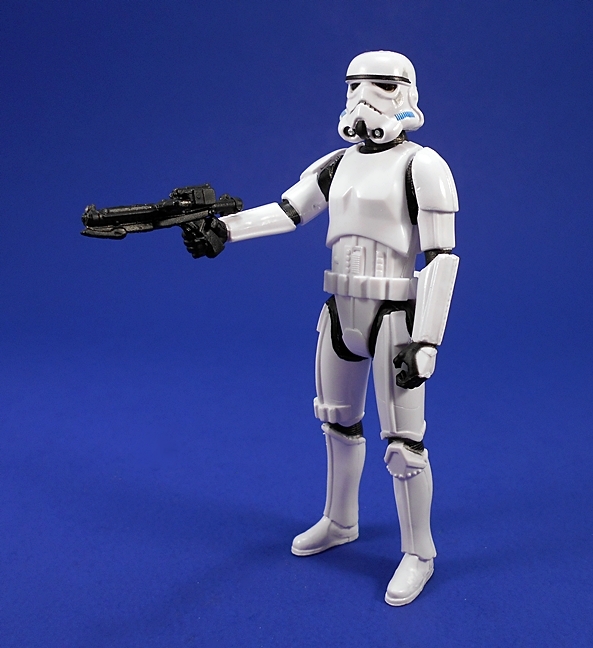 Naturally, the Stormtrooper comes with a standard E-11 blaster, which he can hold in either hand. 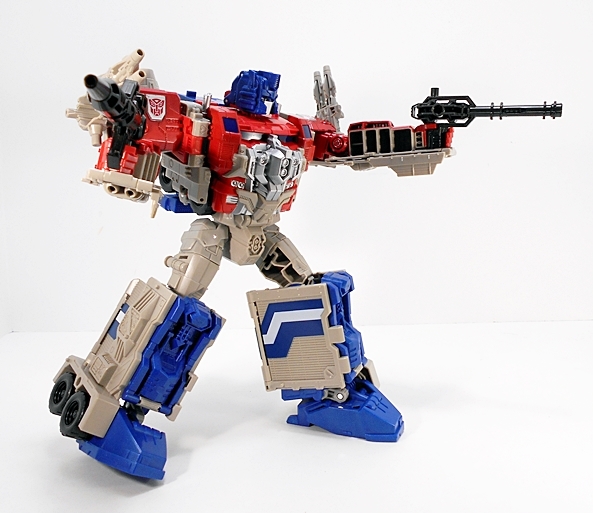 The only knock I can come up with against this guy is that I wish he had a holster for it like some of the super-articulated 3 3/4-inch Stormies of the past. He also comes with a pretty clever combination of chest pieces to add a little play value. The back of the card describes these guys as the people who keep the spaceports and Imperial facilities running. 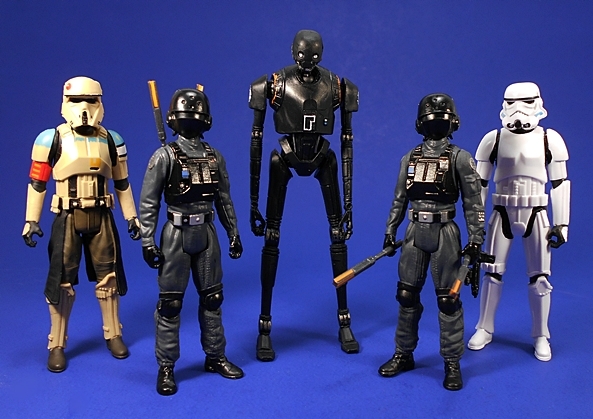 I’m always up for expanding my Imperial forces and I love the idea of getting background support characters like these to fill out hangers or other displays. 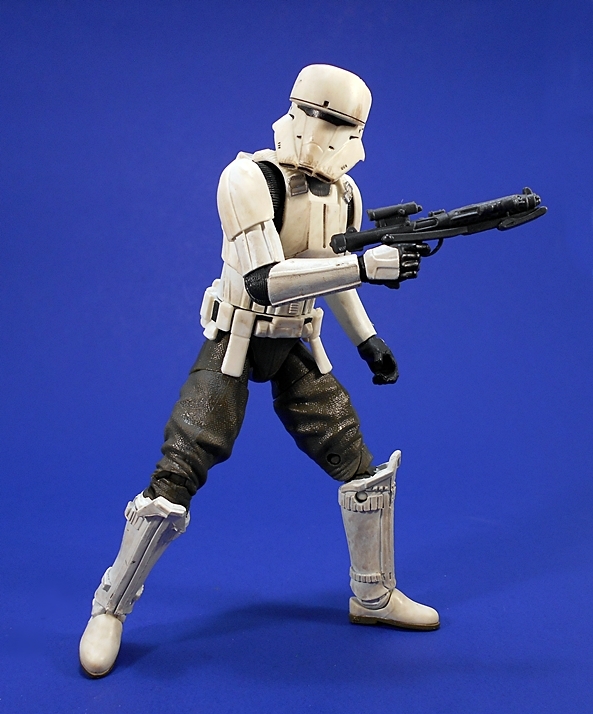 He has a very classic Imperial look to his outfit, what with the cheery dark charcoal gray on black deco and I can certainly see a couple of these guys strolling through the background on one of the Death Star scenes in A New Hope. 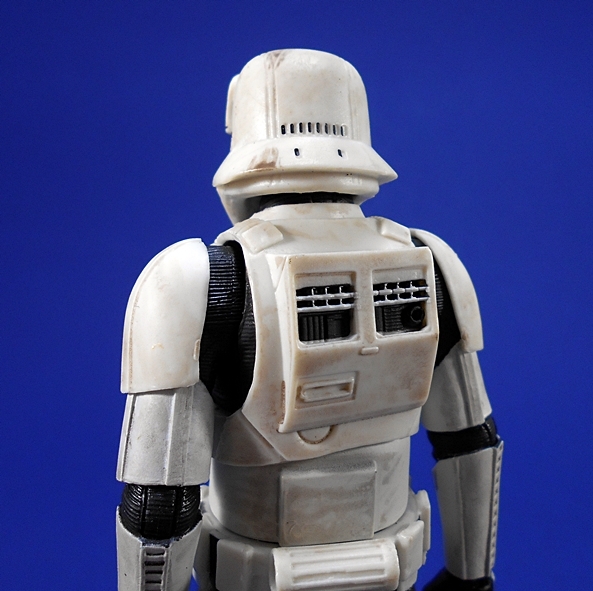 Indeed, the helmet is very reminiscent of the Death Star Gunner. This guy features some very sharp paint detail. 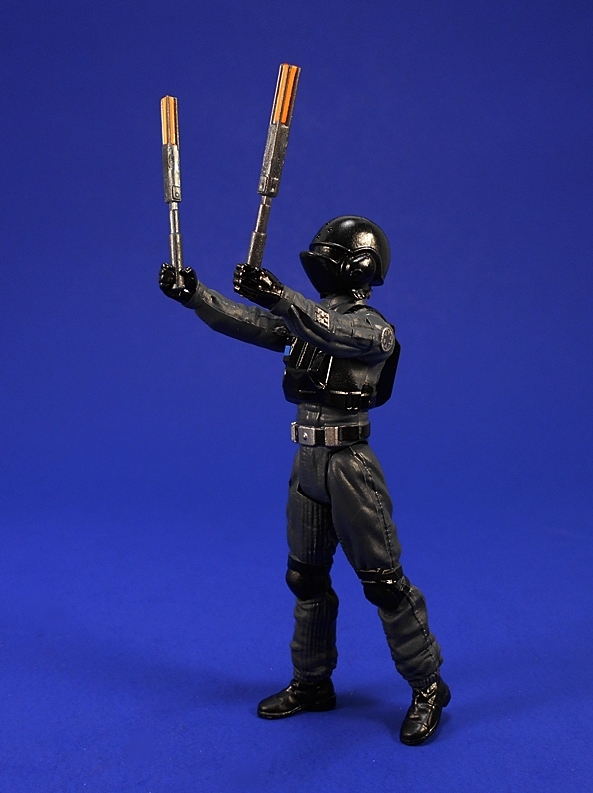 The Ground Crewman has a backpack that stores his batons, although they have a habit of falling out. What the hell? I’m totally torn on this thing. 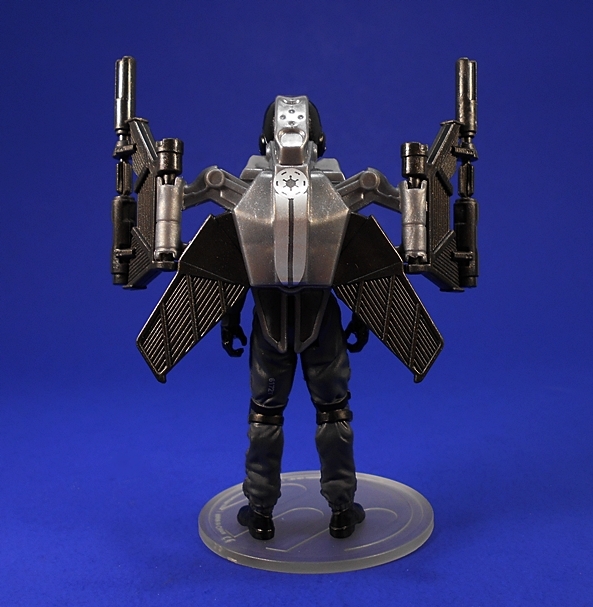 On the one hand, for a made-up toy gimmick accessory it looks really cool, even if it isn’t something I’d expect to see in a Star Wars film. The sculpt is beautifully detailed and there’s some excellent paint work. On the other hand, why would these guys have something like this? Oh, wait… it gets better! It does make a pretty nifty drone. 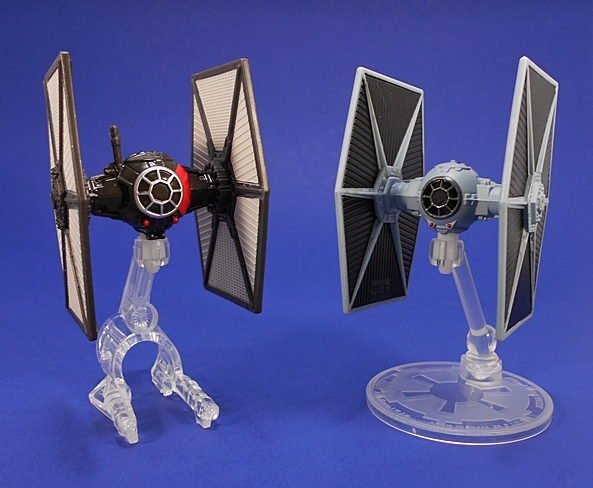 I could see certain Imperial Troops carrying these on their backs and deploying them on the battlefield. And maybe in my own private head canon, these Ground Crew could also serve as Drone Troopers who maintain and operate these things as support craft. Yeah, I spend way too much time thinking about this stuff! Before wrapping up, there are a couple of other things worth mentioning about the Ground Crewman. First off, he’s very short. 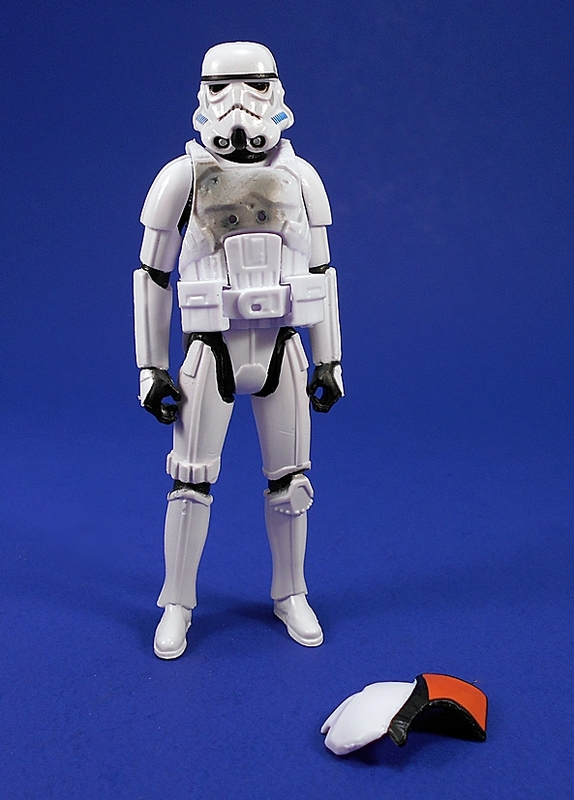 He’s about half a head shorter than the Stormtrooper. 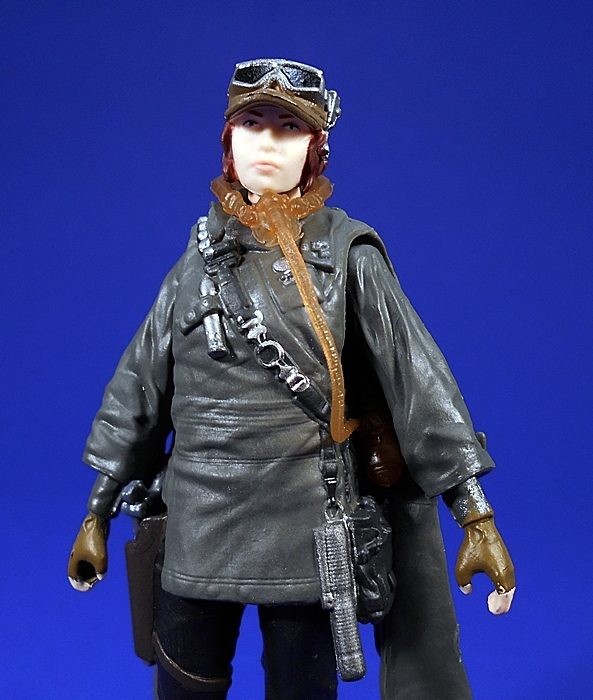 We’ve already seen Jyn wearing a uniform similar if not identical to this one, so it seems like she’s going to bonk one of these guys on the head and steal their clothes. That would explain not only why the figure is so short, but why we’re getting one in the first wave. 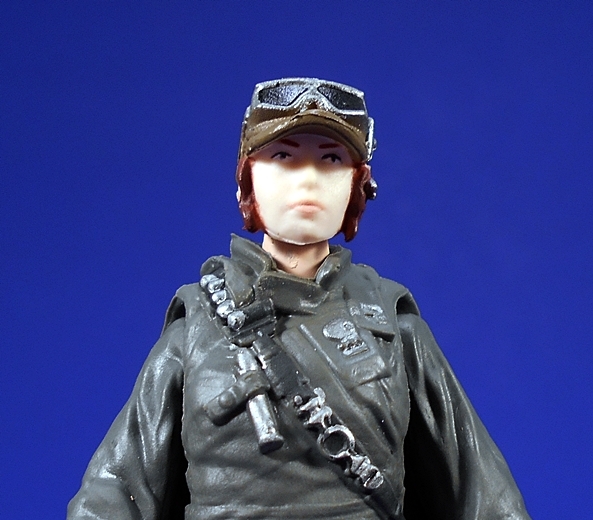 I seem to recall seeing pictures of a disguised Jyn figure and it was just a head swap. I’m not recounting anything original or groundbreaking here, but I just thought it worth mentioning. While I thought yesterday’s pair of figures was OK, I definitely like this pair a lot more. That should be pretty evident, since I already have two of the Ground Crew and I’m actively hunting more Stormtroopers. 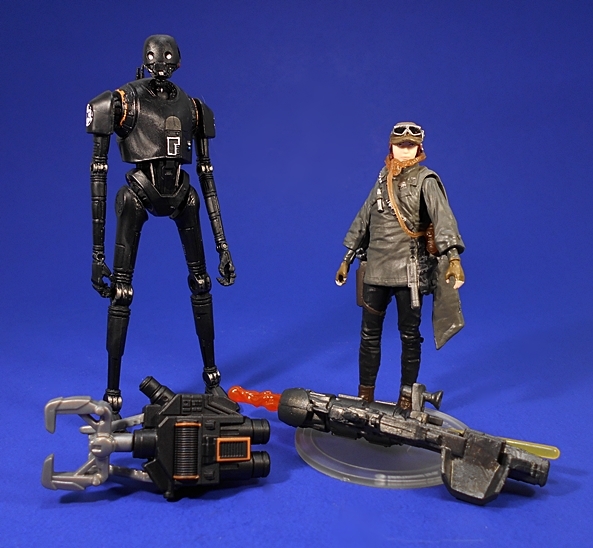 Granted, I’m generally biased toward Imperial figures and it looks like Rogue One will be rich with new Imperial designs for Hasbro to explore through their toys. 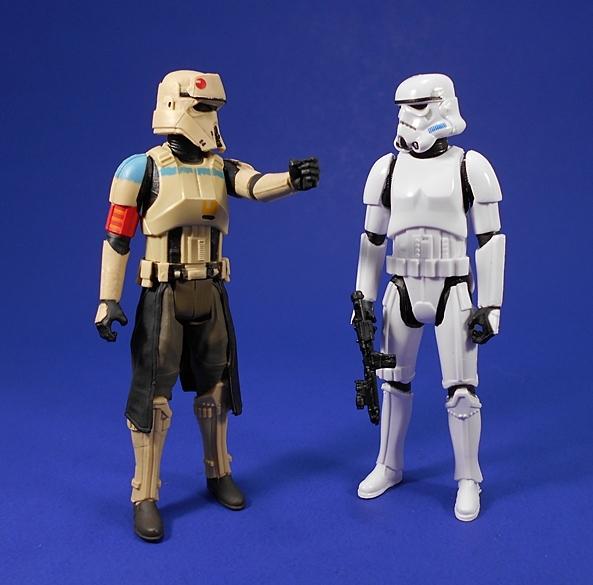 The diversity of character selection here has already been a lot better than what we got for The Force Awakens, as far as I’m concerned and while the 6-inch Black Series has been solid, I find I’m still addicted to these little 3 3/4-inch guys. 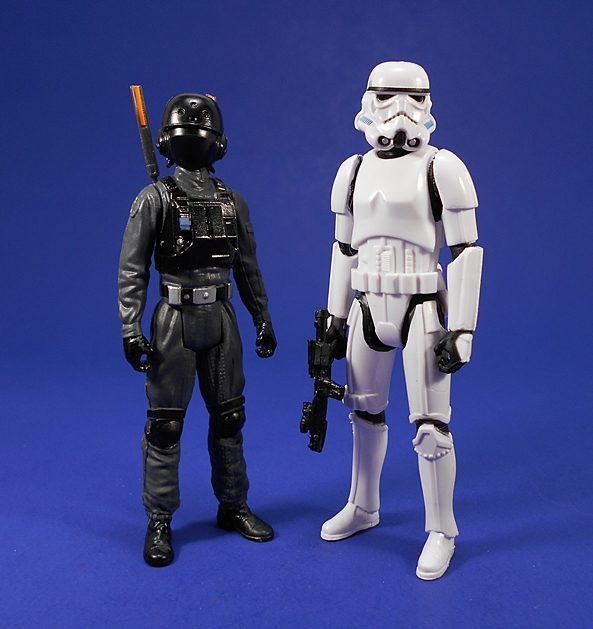 The second wave of 3 3/4-inch Rogue One figures are starting to trickle onto the pegs in these parts, so I thought it long past time that I take a look at the first wave. 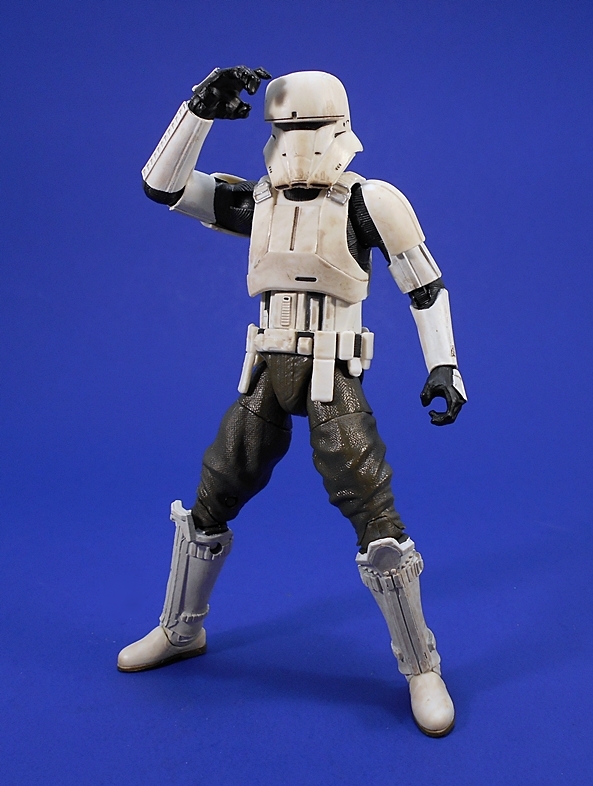 In fact, I’ll be looking at a lot of Star Wars figures over the next few weeks, so I can get caught up before the movie hits. Also, this week is going to be crazy busy for me, so rather than look at all four figures today, I’m going to tackle two today and two tomorrow. Yes, keep in mind that I’m only looking at the Rogue One figures in this wave. I passed on the Kylo Ren and I’ll check out the two Rebels figures later on down the road. So, let’s get this rebellion going with Jyn Erso and K-2S0! OH, BUGGER! I was sure I had a shot of the packages before I opened them, but nope. So, here’s the best I could do. 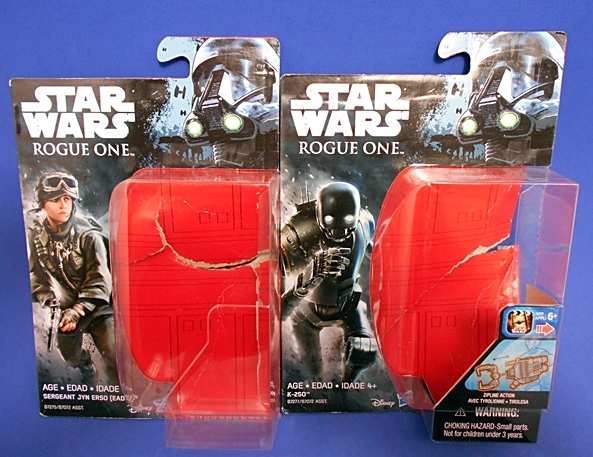 It’s a shame, because this is my first time showcasing the single carded Rogue One packaging. Anyway, you get the idea. 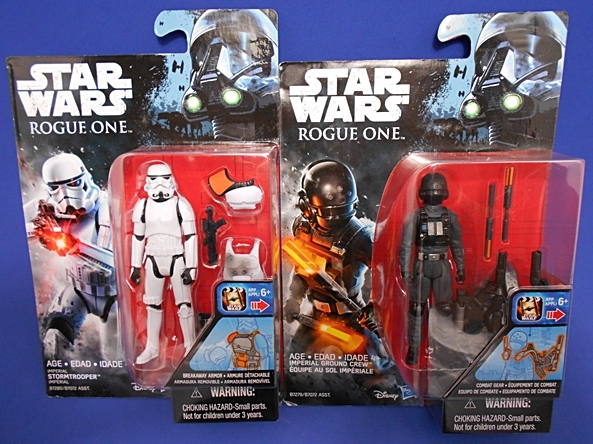 It’s very similar in structure to The Force Awakens packages, but it’s now branded for Rogue One with the image of the Death Trooper in the upper right hand corner. Like the TFA cards, there’s some amazing character art on these packages, making me a little sad to be tearing them open. 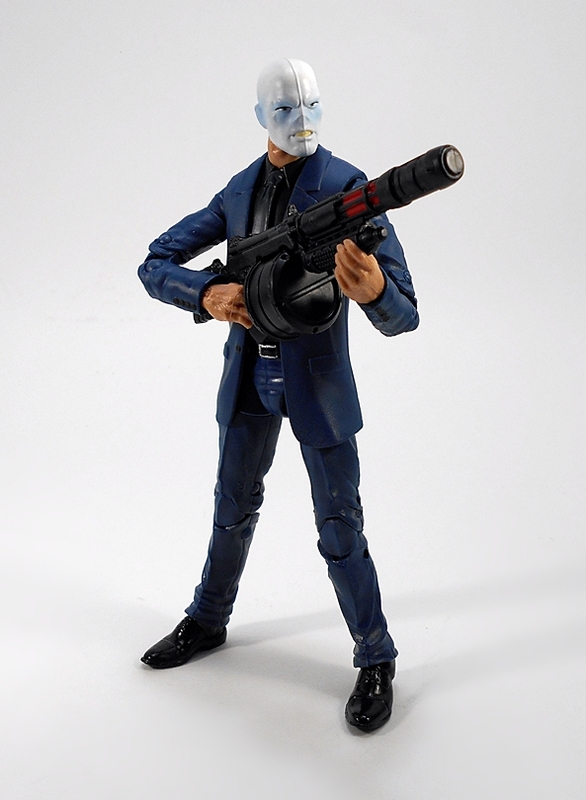 Also worth noting, the Build-A-Weapon gimmick has been replaced with individual weapons and gear for the figures. First up, we have Jyn Erso. 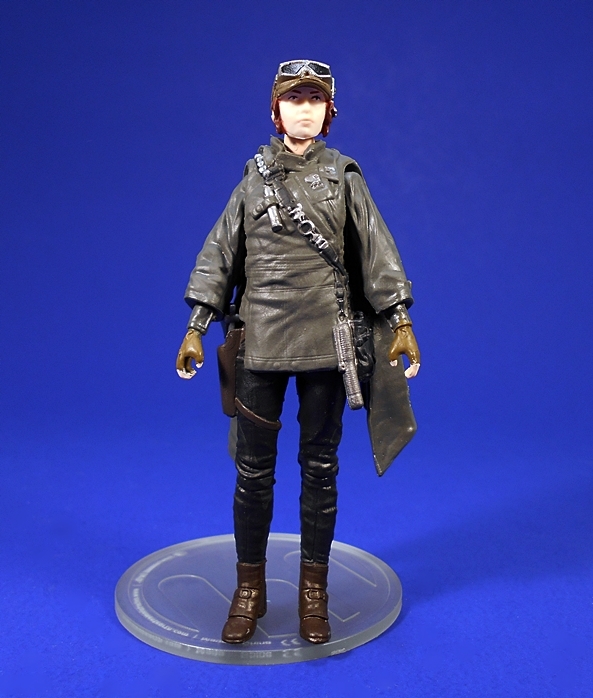 The 6-inch Black Series figure I looked at was based on her appearance on the planet, Jedha. Here she’s bundled up for Eadu, which seems to be a snow planet. This certainly isn’t the flashiest figure, but there’s some cool stuff going on here. 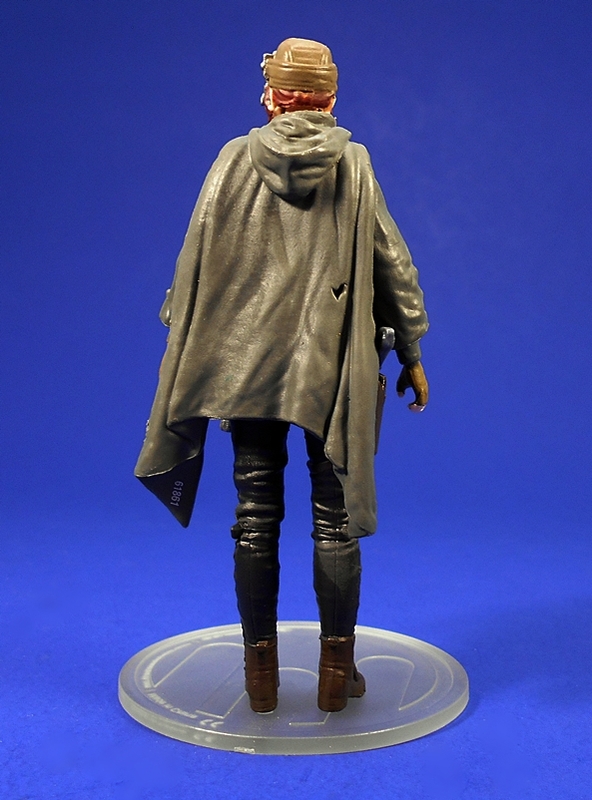 She’s wearing a drab poncho with a sculpted hood down the back and some little bits of equipment sculpted across her chest and on her left hip. Her pants have some sculpted rumples and she has a pair of brown boots. I dig the little torn hole in the back of it, that’s a nice touch. 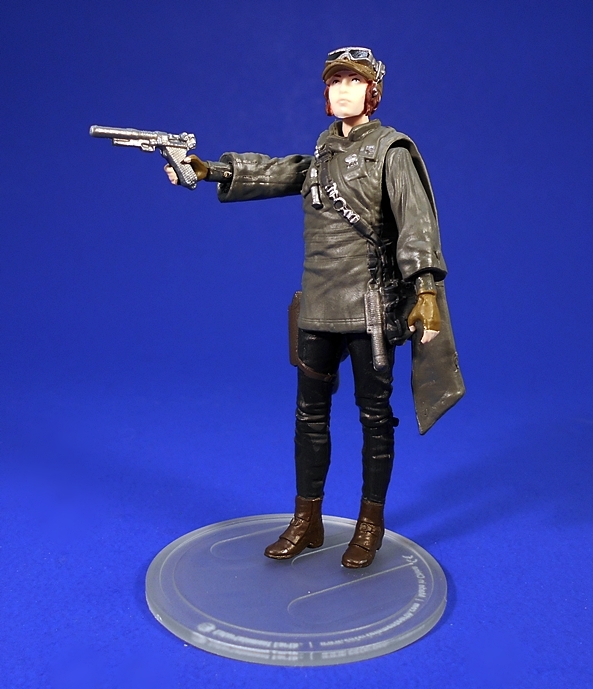 I want to say that I get a little Princess Leia in Endor poncho vibe off of this figure, but then I don’t want to be one of those people for whom everything new in Star Wars has to be a call back to the original films. Maybe it was intentional, maybe it wasn’t. 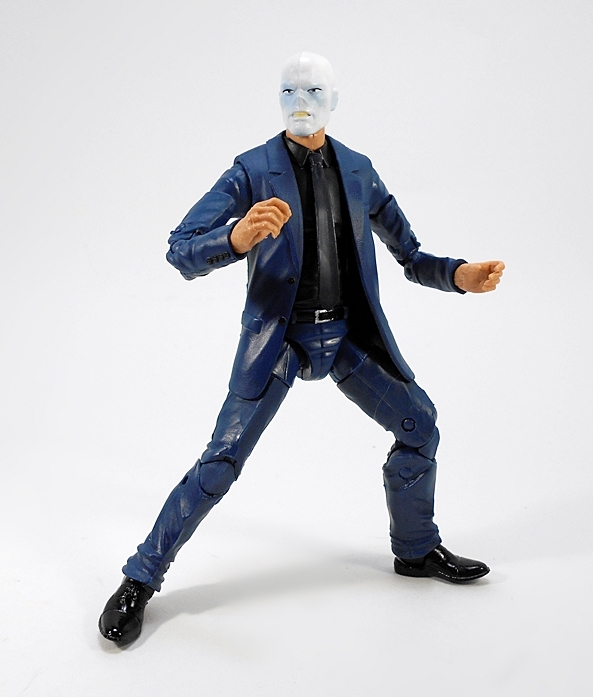 Articulation is the standard 5-points, although the neck is ball jointed, rather than a simple swivel. Her feet seem to be slightly pre-posed so one is supposed to be a little in front of the other, but even taking that into account, I find it really difficult to get her to stay upright without a figure stand. Also, since her poncho extends past her hips, it gets in the way if you put her in a sitting position. I don’t have any Rogue One vehicles, but my guess is she’ll be difficult to seat into a vehicle because of this. The head features a sculpted helmet with goggles. 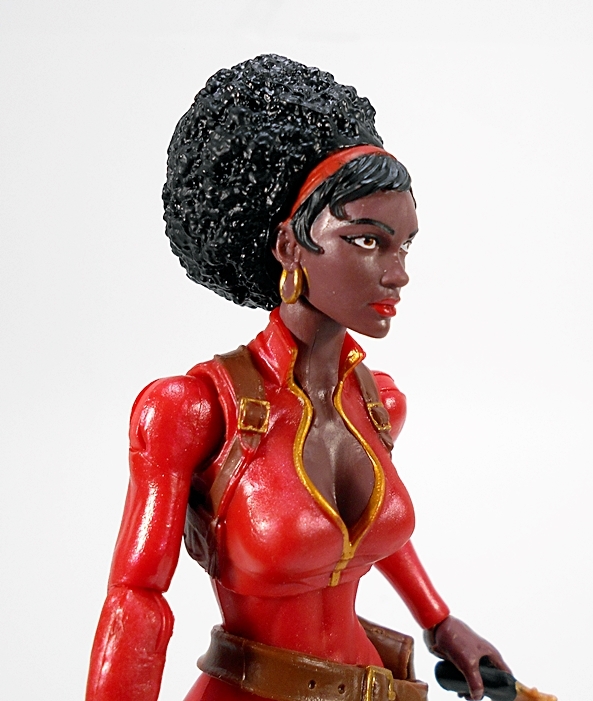 The sculpt is very, veeeery soft and I’d be hesitant to even refer to it as a likeness to the actress. We’re in very vintage territory here, even down to the way the eyes are painted. In short, the portrait here is nothing special, but I suppose it’s passable enough for this scale. On the other hand, this close up does showcase some of the nice silver paintwork on her sculpted gear. 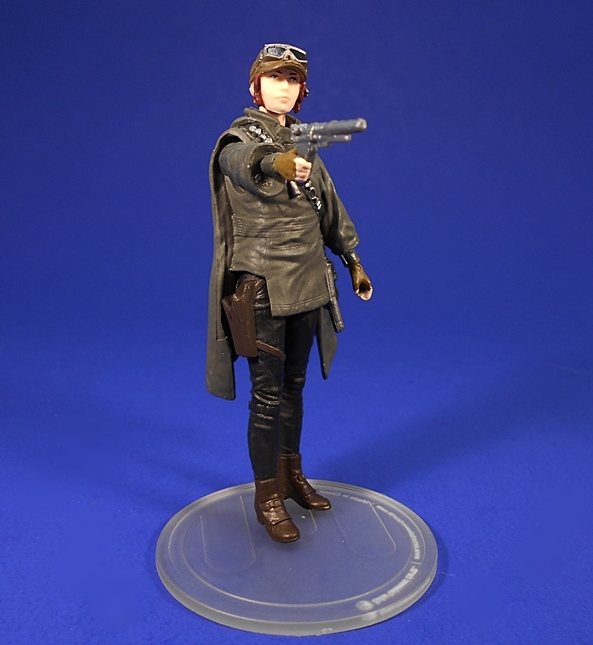 Jyn features a sculpted holster to hold her little pistol and she can wield the pistol in either hand. 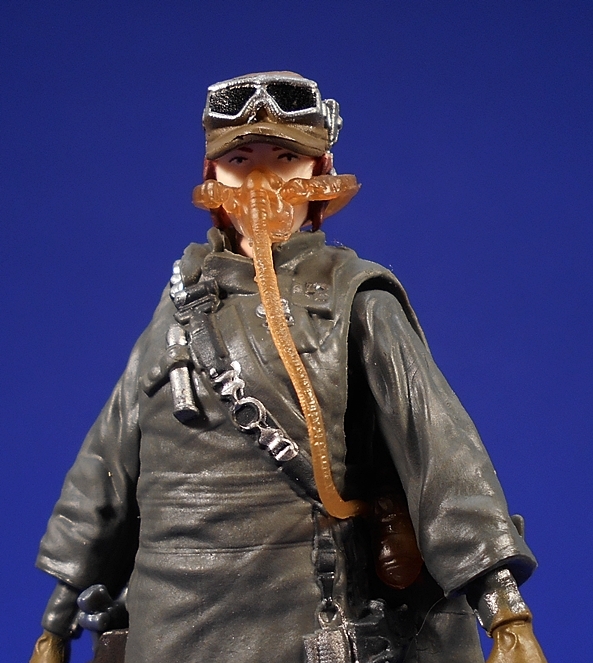 She also has a gas mask that comes on the figure, but is obviously removable. The tank tabs in near her left hip and the you can pop off her head to get the mask on and off the neck. I found it a little tricky to get it onto her face, but once there it looks pretty good. 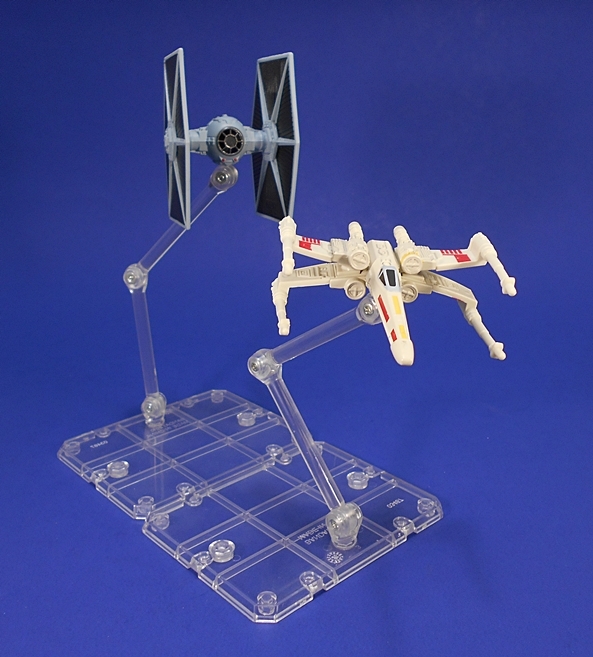 It’s a cool accessory and it reminds me a bit of the breathers in the mail away accessory pack Kenner had back in the day for The Empire Strikes Back. 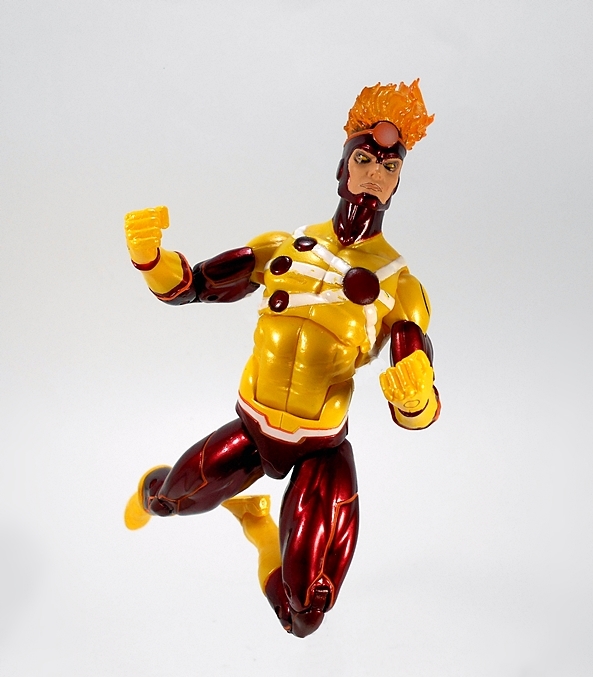 I had a few pre-conceptions about how this figure would turn out and all of them were bad. Most of all, I expected flimsy, warped, gummy limbs and I’m pleased to say that isn’t the case at all. 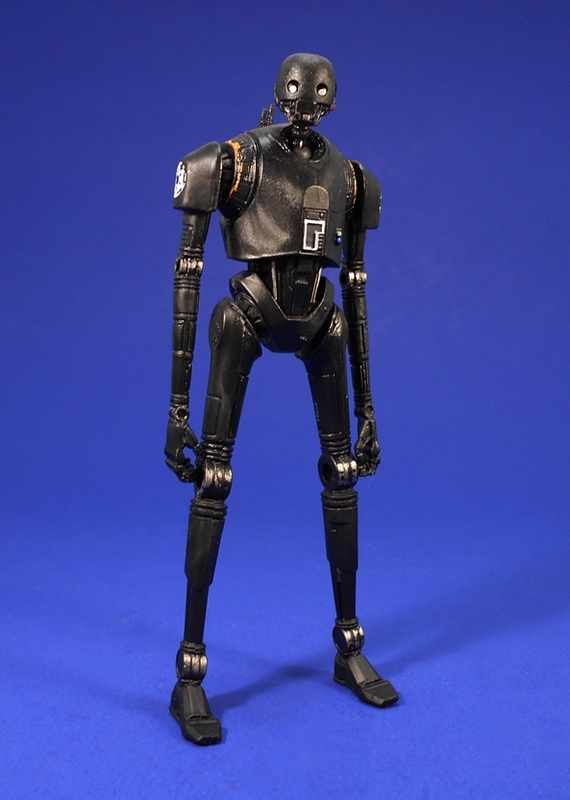 His spindly arms and legs are actually straight and fairly strong, and he actually stands better than Jyn does. 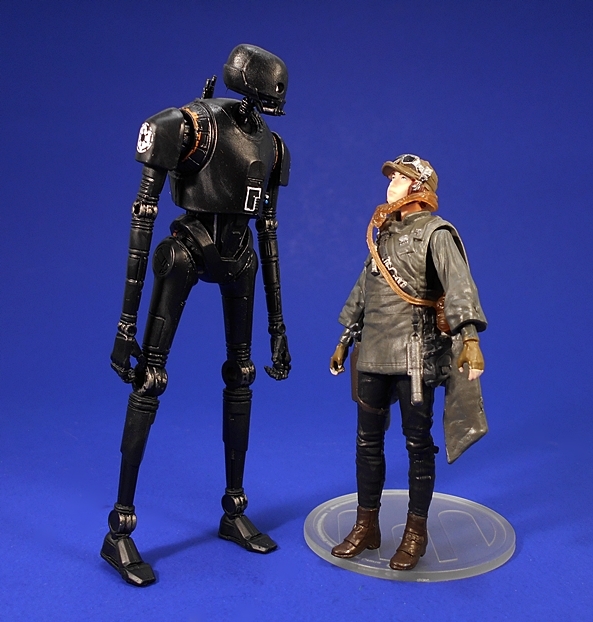 And speaking of standing, K-2SO is a damn big figure for this scale, appropriately towering over Jyn. The articulation is a little bit different than the standard 5POA. 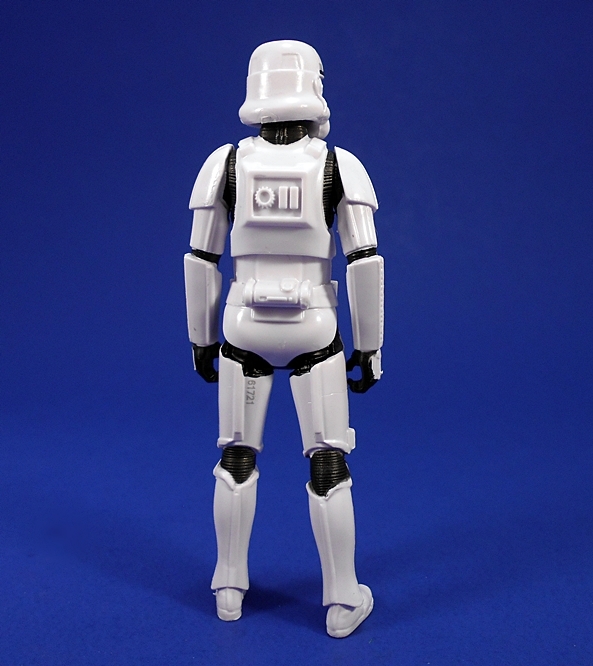 The shoulders still rotate, but the hips are ball jointed and the head is positioned on two ball joints. The sculpt here is excellent. 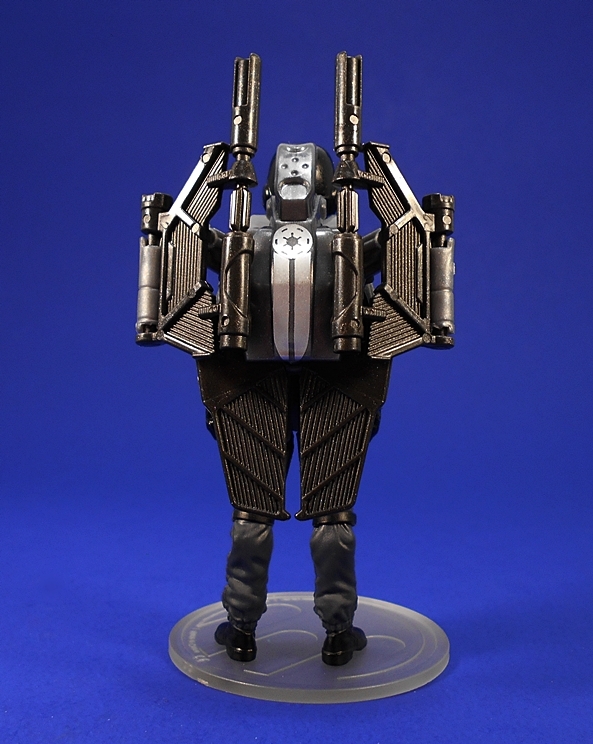 Hasbro managed to pack all sorts of details, particularly in the mid section of the droid. I also like how they left the knee and elbow joints empty slots. The paint is passable. The Imperial emblems on the shoulders look good and there’s some nice silver dry brushing. The orange around the arm sockets, however looks pretty rough. 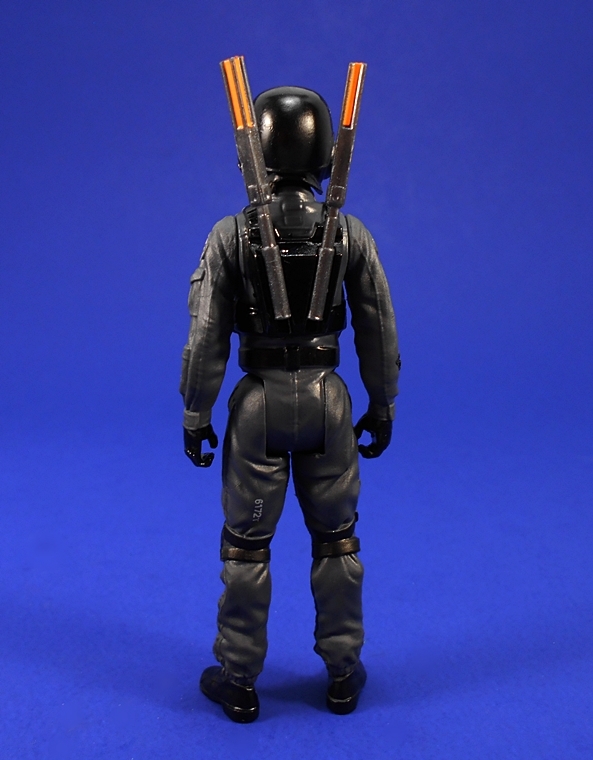 K-2S0’s only accessory is his gimmick piece and that’s a zipline with a claw on the end. Much to my surprise, I actually don’t hate this thing, although I think it would have worked better as a backpack. I may try giving it to one of my 6-inch Black Series figures. It may scale better with them. 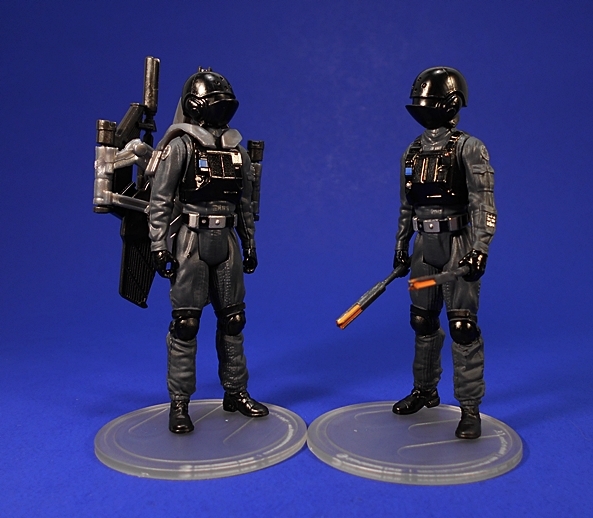 All in all, this is a decent pair of figures. There’s nothing terribly exciting here for me, but I like them well enough. I know, that’s not a resounding endorsement, but I tend to have more fun just playing around with these then I do shooting them for reviews. While I know the 5-POA business is still rubbing a lot of collectors the wrong way, I can honestly say, it’s grown on me and I get a little jolt of nostalgia whenever I open a new one, even if that sentiment isn’t always reflected here. I think this is a big reason why, if you’re going to go back to vintage articulation, you really need those vehicles to help enhance the figures. But maybe that’s just me. 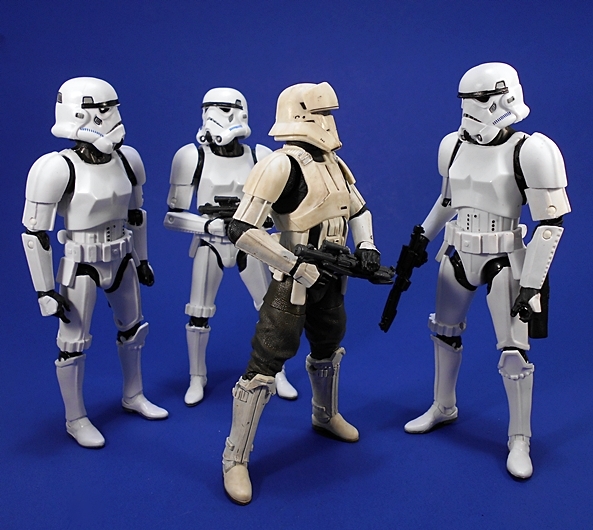 Tomorrow, I’ll be back to look at the second half of this wave: The Stormtrooper and the Imperial Ground Crew. 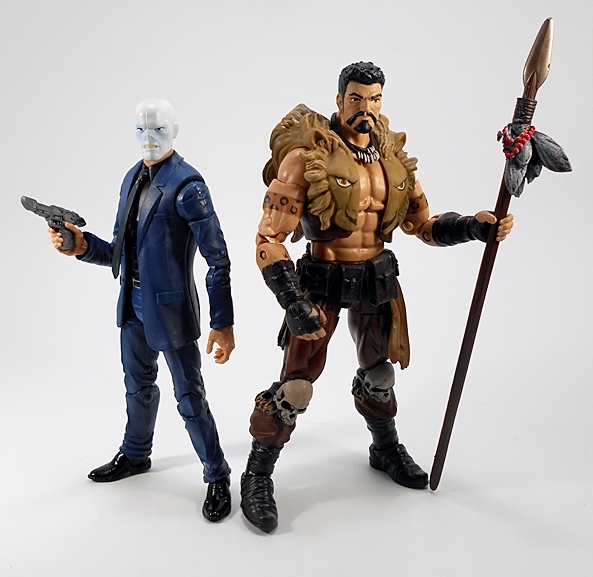 I’m continuing my slog through the now ridiculously outdated Rhino Wave of Marvel Legends, and today lands me on the second half of the “Savage Force” slot with Chameleon. 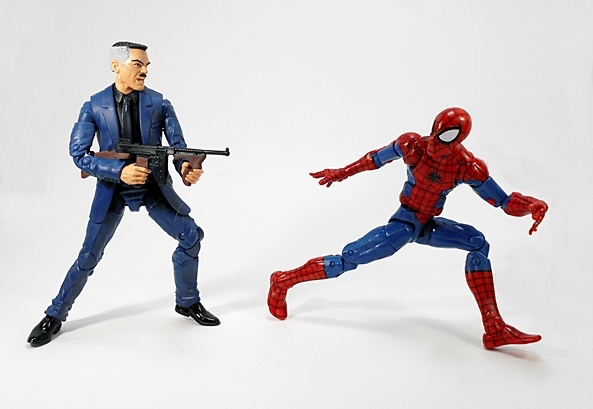 This is a figure that was not only an easy release for Hasbro, but also one that brings us all the way back to the earliest days of Amazing Spider-Man. 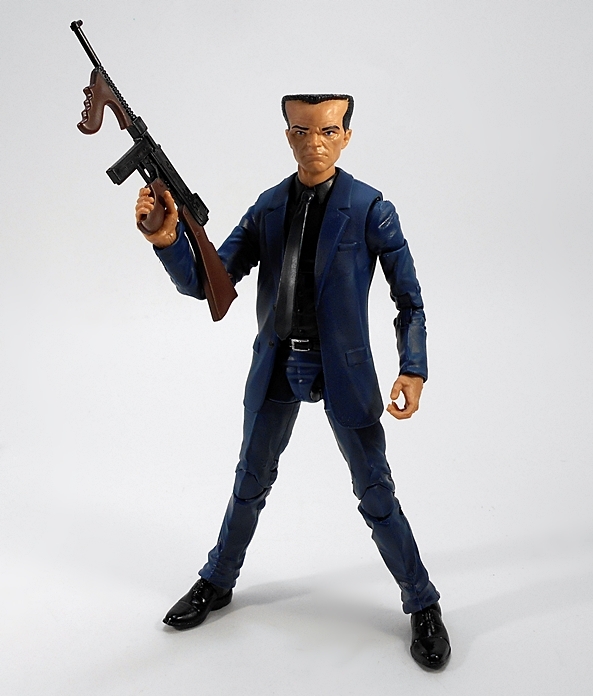 The most obvious thing about this figure is that from the neck down he’s just a repaint of the Legends Phil Coulson figure from that Agents of SHIELD 3-pack. That means, you’re getting a guy in a business suit. 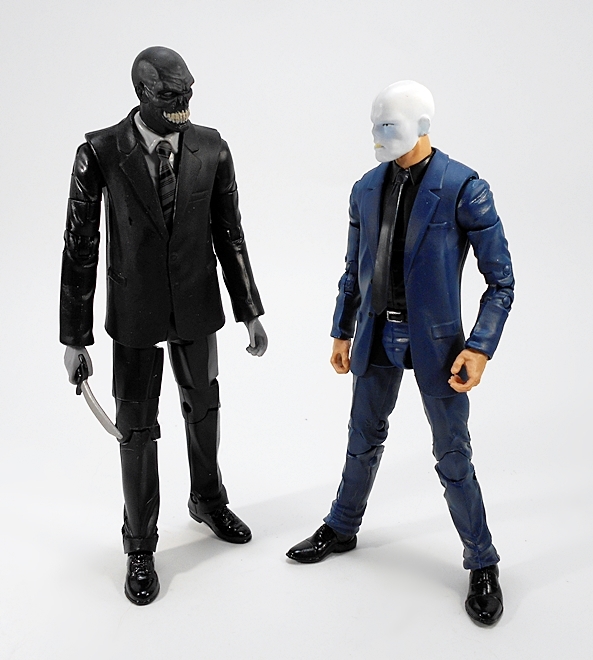 The slacks and jacket have been recast in blue plastic. The shirt is matte black and the shoes and tie are gloss black. You also get some nice sharp silver paint on the belt buckle and I absolutely love the sculpted row of buttons on the bottom of each sleeve. That’s just a lovely little touch. This is a great looking buck and apart from using a remold of it for Bruce Banner, I’m surprised we haven’t seen more of it. 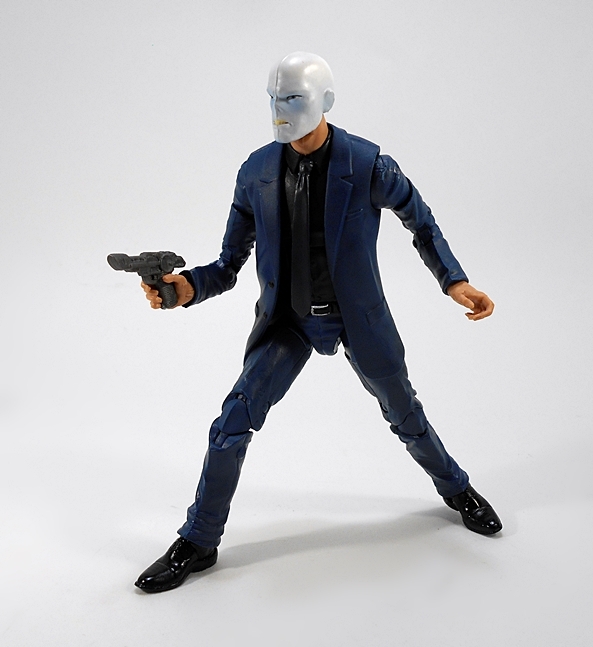 Personally, I would have loved to see Chameleon in the more classic smoking jacket, but I can understand Hasbro wanting to re-purpose this body and to be fair, it works quite well. The Chameleon head is pretty cool. 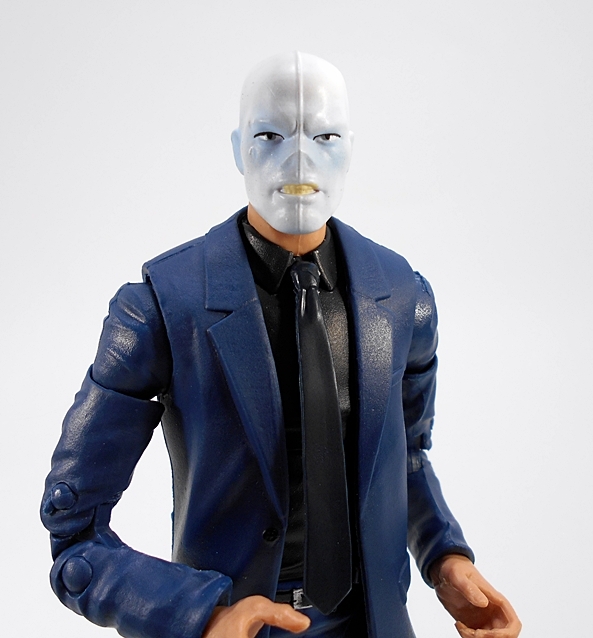 He’s wearing his creepy and almost featureless white mask with a seam running down the center. There’s some nice blue shading in the center and you can see his gritting yellow teeth through the mouth hole. The articulation here is quite solid. You The arms feature rotating hinges in the shoulders and wrists, double hinges in the elbows, and swivels in the biceps. 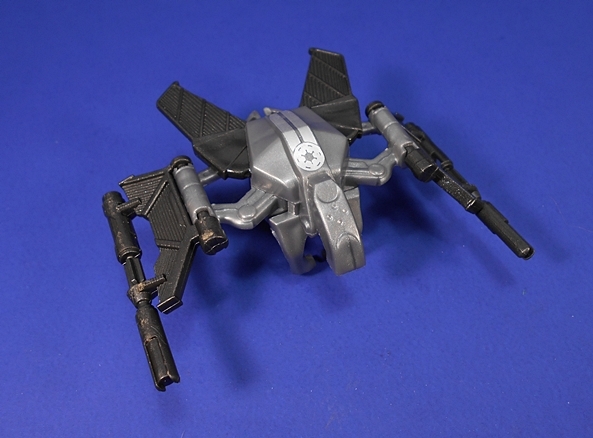 The legs are ball jointed at the hips, have double hinges in the knees, and swivels in the thighs. 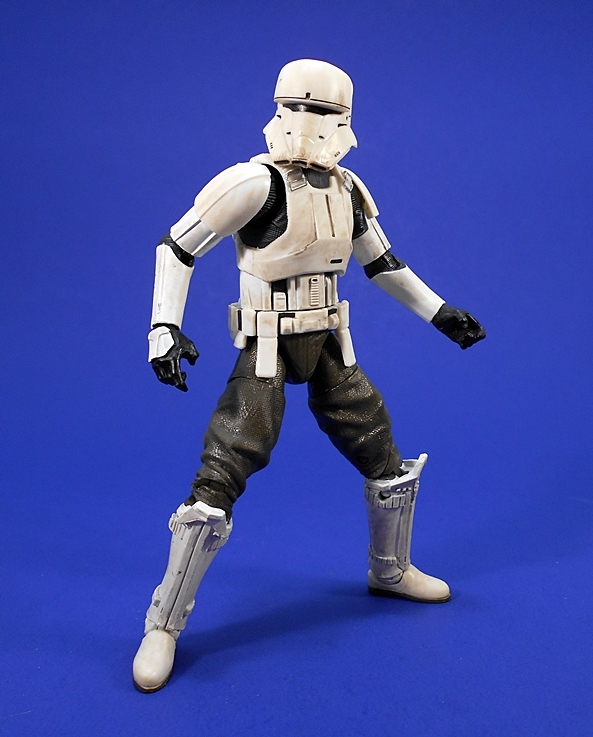 The ankles have hinges and lateral rockers, but I can get hardly any movement out of those joints on my figure. The torso feature a swivel in the waist and an ab crunch in the chest. Finally, you get both a hinge and a ball joint in the neck. While Chameleon can be a fun figure to pose, the lack of mobility in my figure’s ankles make him a chore to keep from falling over. Chameleon comes with two extra heads to show off his ability to assume the appearance of other people. Of course, you can also just use these heads to make that character. It’s all up to your imagination and personal preferences. 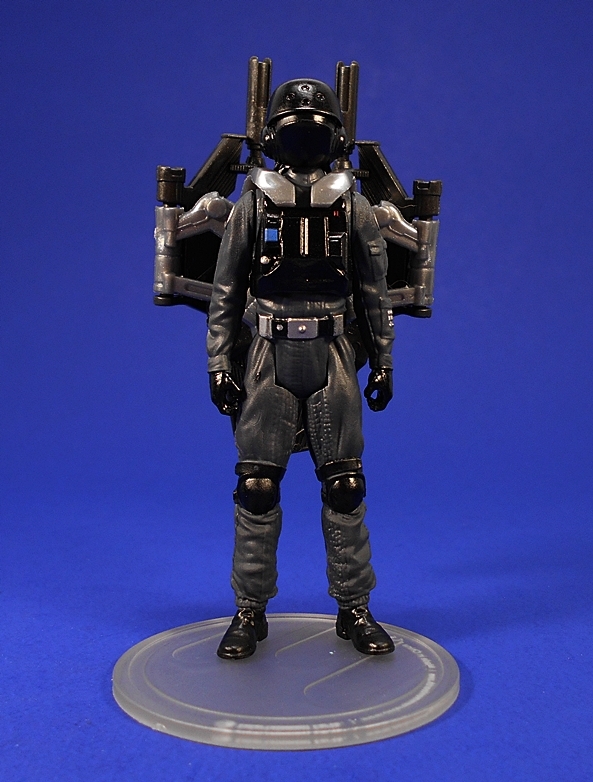 First off, we have Hammerhead. I absolutely love this head sculpt. 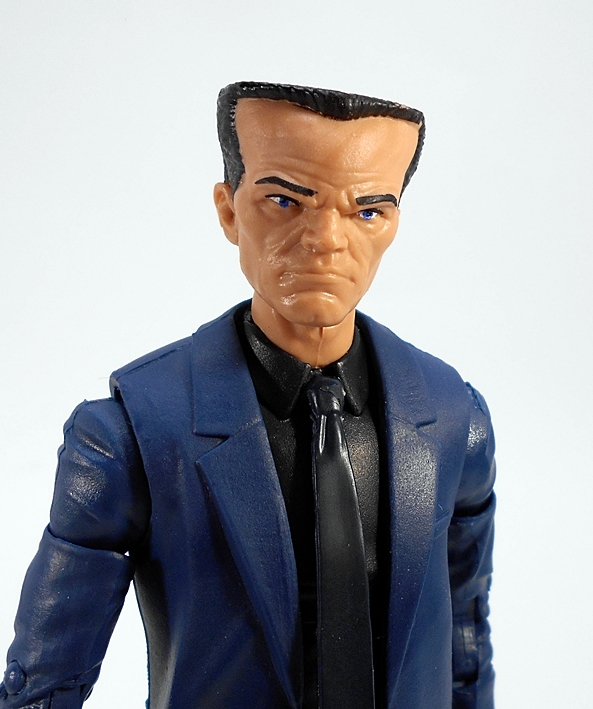 It’s a wonderful sculpt and would be very distinctive even if it weren’t for the flat top head. Granted, he really should have a vintage gangster-style suit, but it still works OK with the body here. For starters, you get this little futuristic pistol, which kind of reminds me of Cobra Commander’s vintage sidearm. It sort of has that blow-dryer look to me. But, that may be me just mis-remembering what that old gun actually looks like. Either way, this is a really cool sculpt and I think it suits Chameleon quite well. Next up is this behemoth! I have no idea what it is, but I love it. Despite it’s futuristic design, it has a pretty standard detachable drum magazine with bullets coming out of the top that peg into the slot under the rifle. You get a nice textured grip under the barrel and some red paint apps on the sides of the barrel. This thing may be too damn cool to let Chameleon keep it, but I haven’t decided who to give it to yet. It may wind up going to The Red Skull. Next up is the Tommy Gun and since it’s commonly associated with gangsters of the 20’s and 30’s, this one really suits Hammerhead. 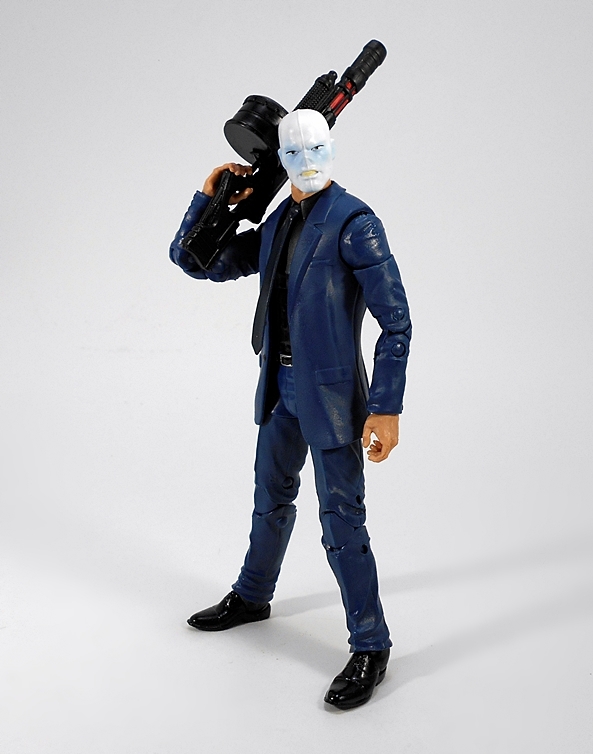 While not quite as impressive as the amazing Thompson that DC Collectibles gave us with their Icons Joker, this is still an excellent weapon for this scale. 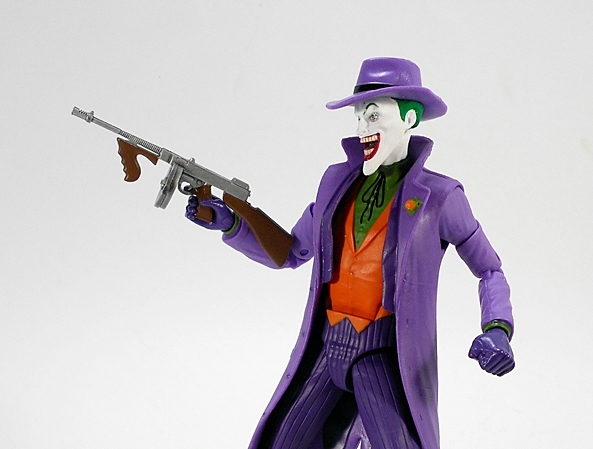 The sculpt is spot on and you get brown paint apps on the wood fixtures on the stock, pistol grip, and the grip under the barrel. The black finish looks great too! There’s really nothing in the way of accessories to give to Jonah. It would have been cool if they threw in a rolled up copy of The Daily Bugle. That’s OK, though. If I display this body with Jonah’s head, he’s always going to be waving his hands over his head in rage. It fits the shouting head sculpt so well. 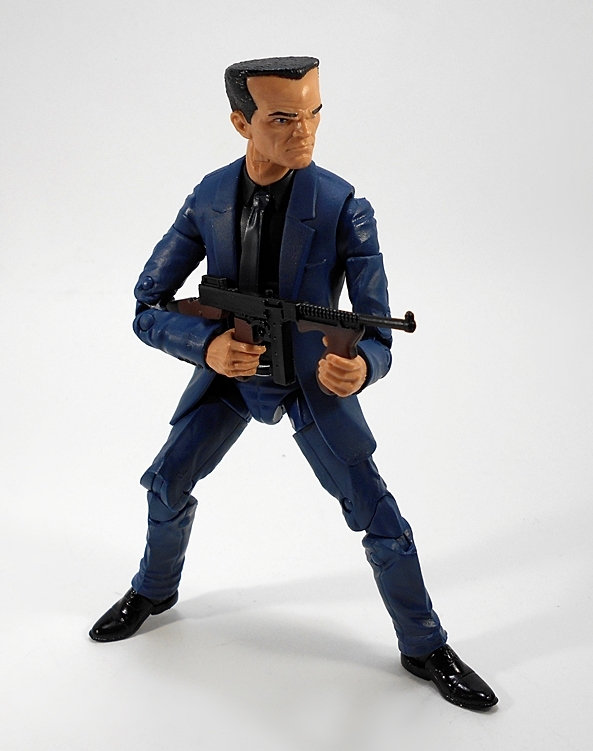 I’ll confess, knowing he was largely just a repaint of Agent Coulson, I wasn’t all that excited about getting Chameleon at first. 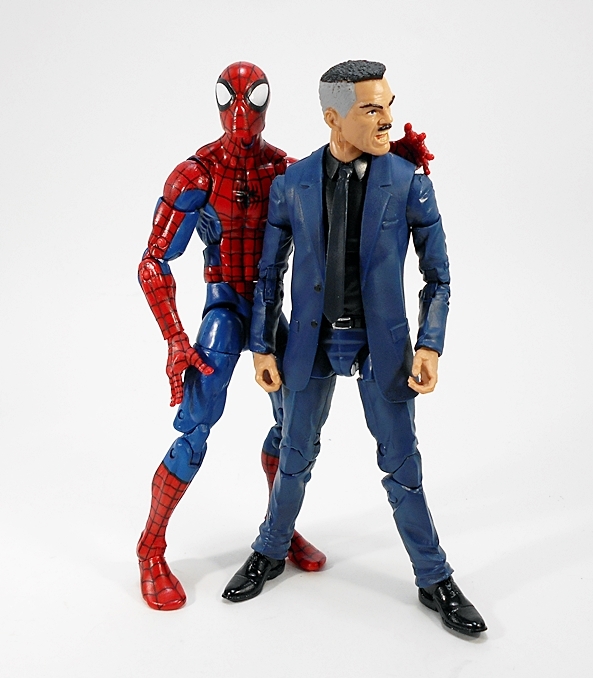 But in hand, this figure is a lot of fun. Not only do the extra heads make it like three figures in one, but the weapons Hasbro packed in with this guy are all excellent. Not to mention there’s so much classic Spidey goodness bundled into this box that it’s hard not to love it. Interestingly enough, Chameleon was the hardest figure in this wave to track down. Amazon has been a good source of Legends for me in the past, but Chameleon has been languishing there in the $30 range for a while. I ultimately turned to Hasbro Toy Shop where I was able to get him at regular retail with free shipping. It’s been more than a few Anime Saturdays since I last tortured you all with my Kantai Collection obsession, so let’s visit with another one of Taito’s Fleet Girls. This time, it’s the adorable Shimakaze! Yes, for a change I’m actually looking at a character from the anime series and not just the video game! We’ve seen Taito’s packaging many times here, and there isn’t much different here. You get a fully enclosed box with some striping on the bottom half and lots of pictures of the figure inside. 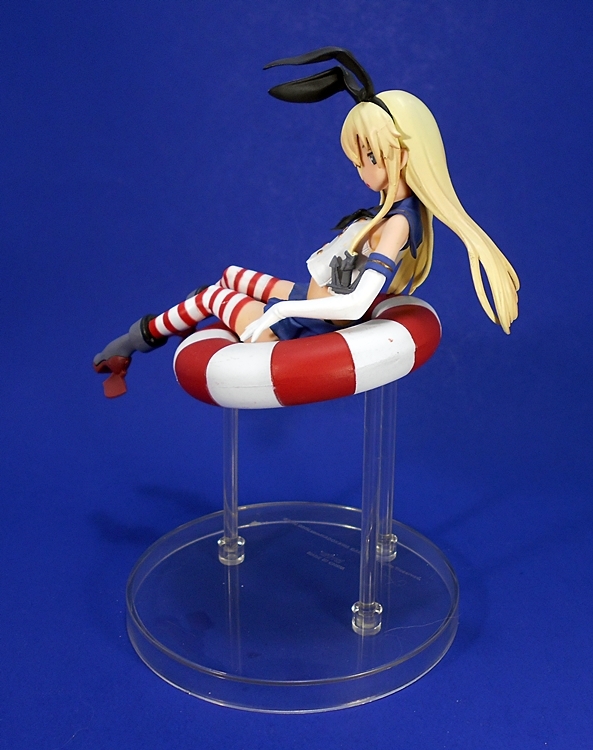 Despite Shimakaze kicking back in a life preserver, this release is not classified as one of Taito’s “Day Off” figures. 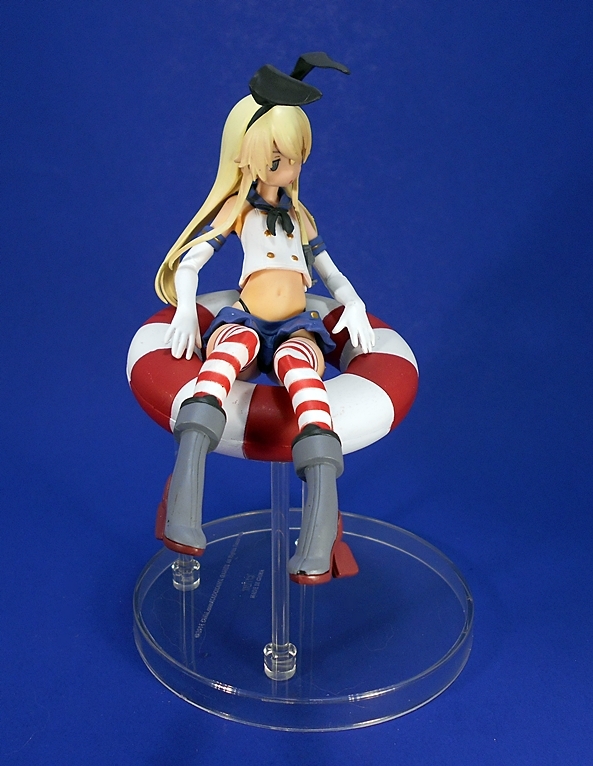 I’m guessing that’s because Shimakaze is dressed in her uniform and not a swimsuit. Then again, some of the other “Day Offs” were in uniform. I’m so confused!!! Also, I know what you’re thinking. 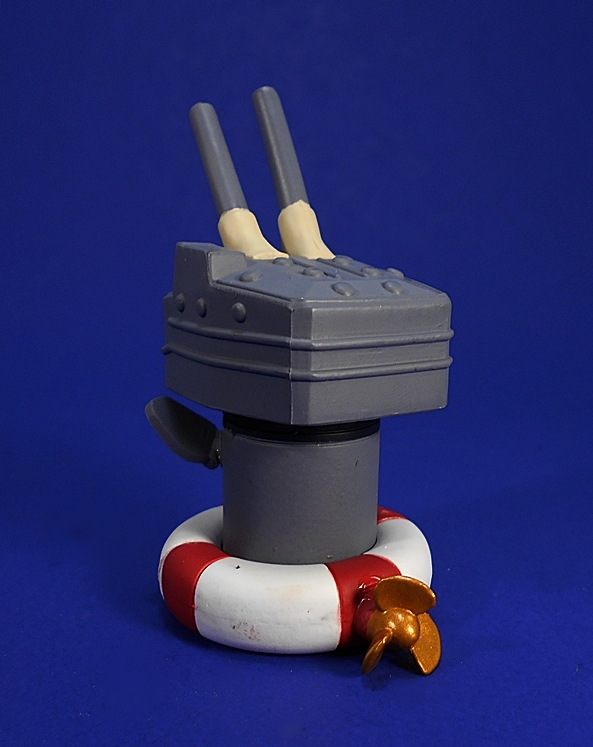 Hey, that looks an awful lot like the Submarine Ro-500 figure that you featured a few weeks back. 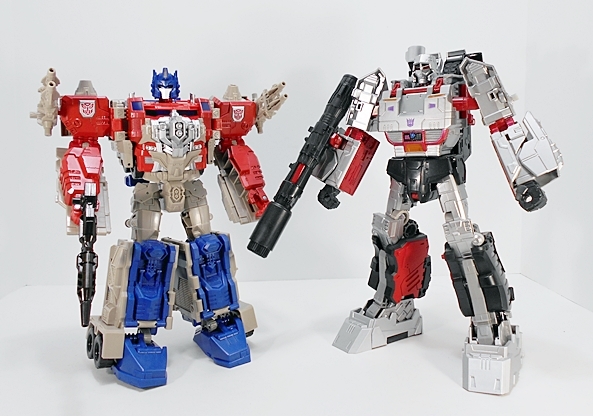 Yes, there are certainly some similarities here, but it’s still an entirely new figure, preserver, and base. So, as already mentioned, Shimakaze reclines on a red and white life preserver and decked out in her uniform, but minus her armaments. Her outfit features her cut-off top, long gloves, blue skirt, exposed g-string, candy-striped stockings, and rudder boots. It’s all beautifully sculpted here and the skirt and top are layered onto the figure, which is always a bonus. Even the collar and neckerchief pops up off of the top to give it some added dimension and credibility. 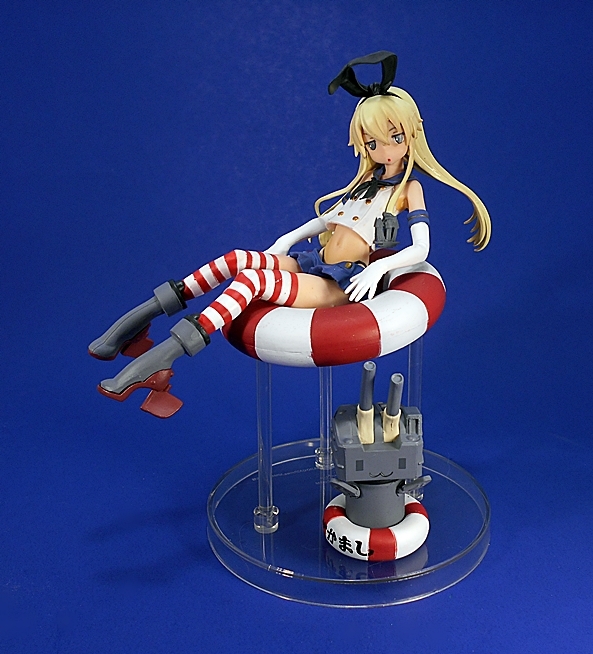 The figure itself simply rests in the tube, just like we saw with Ro-500, so you can pick her up and check her out from all angles. The life preserver sports a little less detail than R0’s, as it’s missing the rope running around the edges. And while I’m overall very happy with the sculpt here, I think the way the hair parts looks a little unnatural from the back. That having been said, it looks fine from the front and that’s the way I’ll be viewing the statue most of the time, so it isn’t a big deal. 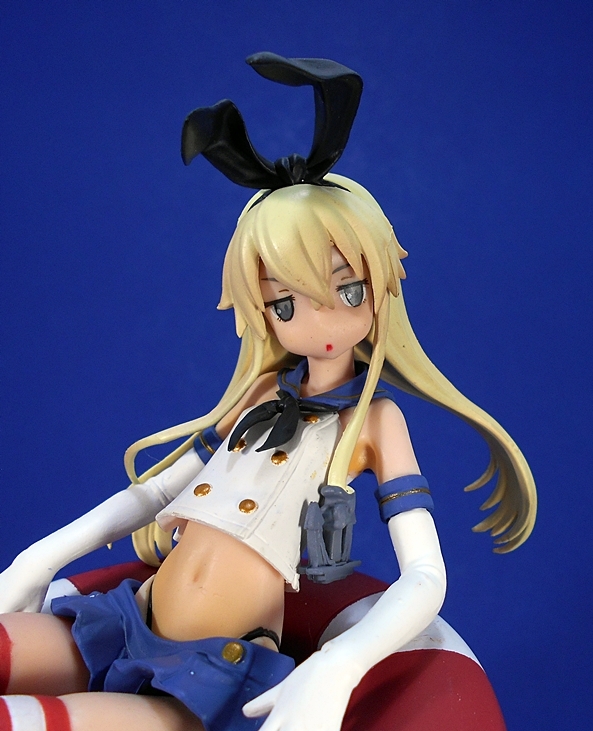 The portrait is fantastic and depicts Shimakaze with her traditional rabbit ear headband and perturbed expression. I’m interpreting the expression as her being annoyed at being knocked out of commission, hence the life preserver and lack of armaments, although it doesn’t explain why her uniform isn’t shredded, so I might be reading too much into that. On the downside, the above closeup shot shows that the quality of paintwork on this piece is really disappointing. The white ares show a lot of dirt and smudging and even her face and hair is rather dirty. The lines on her stockings are rough in some areas and there’s scratching on the preserver too. To be fair, if I’m viewing this piece from a display shelf, it’s not that bad, but the closer I get, the more noticeable it is. This is easily the worst paint on any of my Taito prize figures, and considering who the character is, that’s doubly disappointing. The base is very similar in design to Ro-500’s base. It’s a simple clear disc that uses three support poles to hold up the life preserver, which pegs in securely. 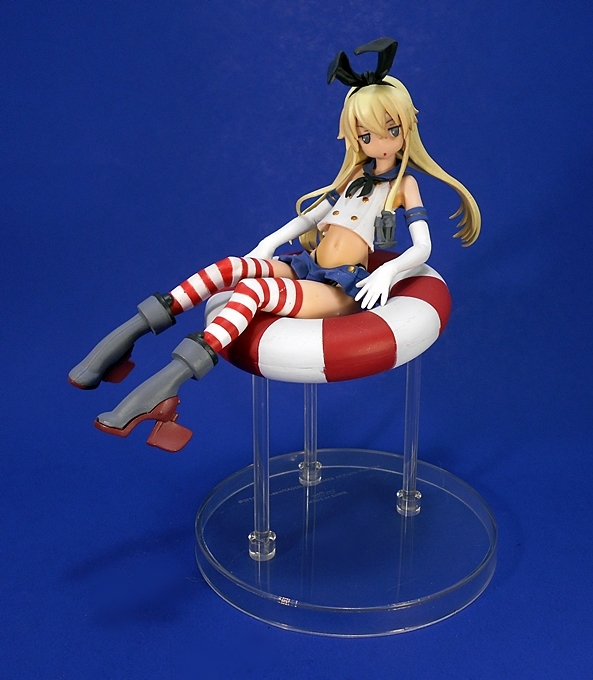 Of course, you can’t have a Shimakaze figure without her Rensouhous and in this case you get the largest of the gang. 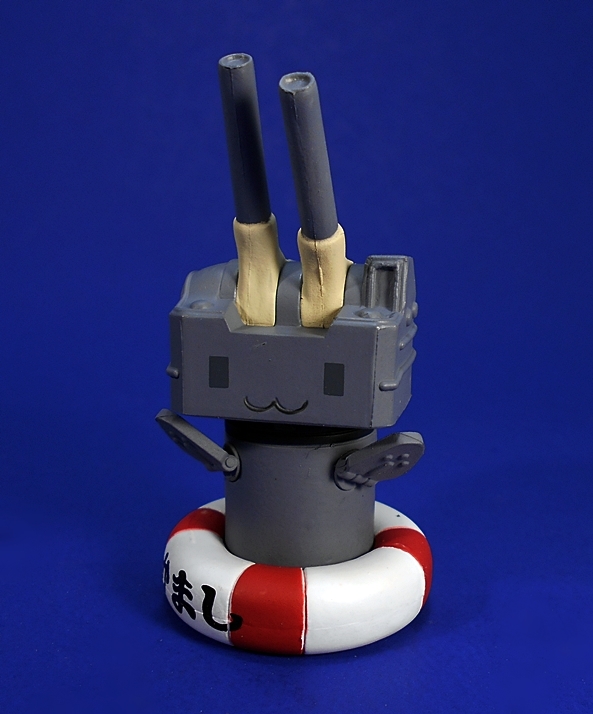 Rensouhou-chan comes in his own little life preserver with a propeller sculpted on the back. He seems happy enough, which further suggests that I’m off base on my theory that this is Shimakaze after she’s taken a crippling hit. 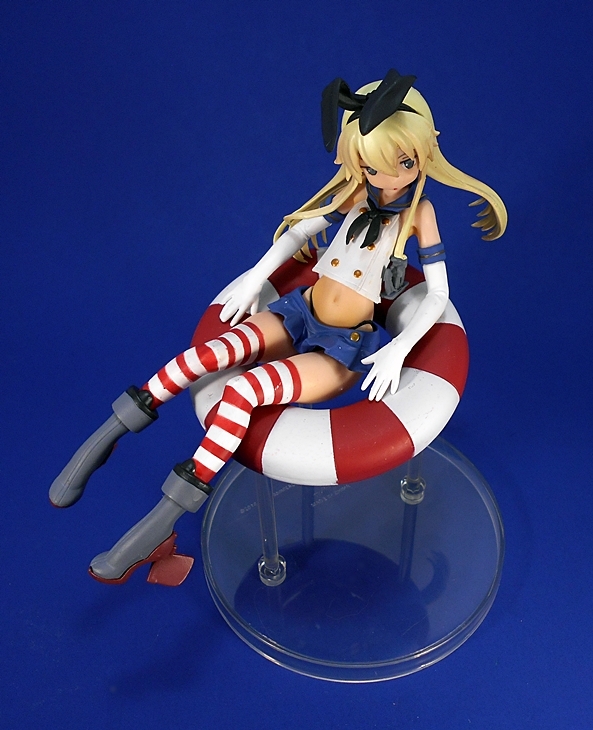 Rensouhou-Chan didn’t escape the shoddy paint problem either. There’s quite a bit of dirt on the white parts of his preserver. 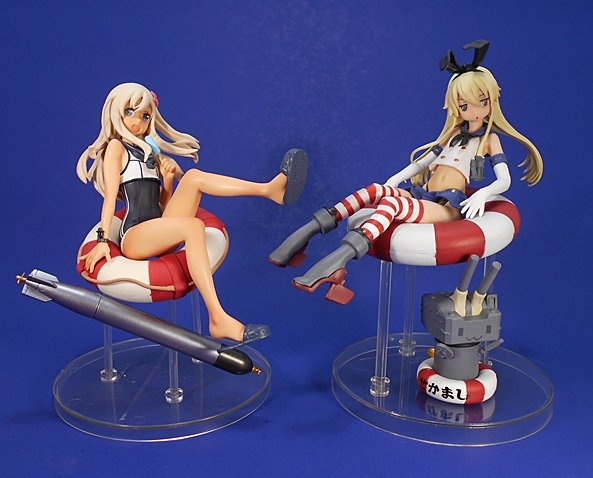 Shimakaze looks great displayed next to Ro. Now, I’m guessing she looks upset because she doesn’t have an ice pop, or maybe because her paint job isn’t as good. 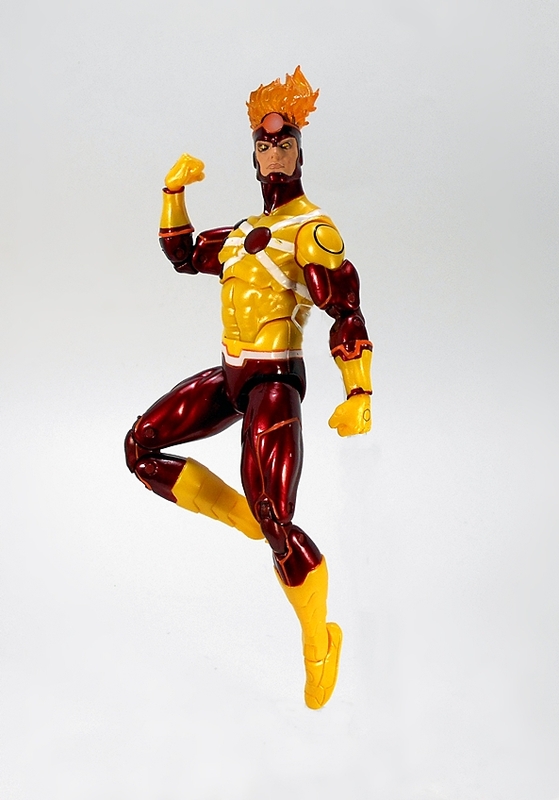 I’ve had my eye on this figure for quite a few months, waiting to finally find one shipping from inside the US. I also had to pay a little more for her, but she was still under $25 shipped, and I still consider that a great deal. It’s just too bad that the one I got has a sub-par paint job. If I had to choose, I would much rather have had rough paint on one of the Fleet Girls from the game, rather than one of my beloved characters from the anime series. 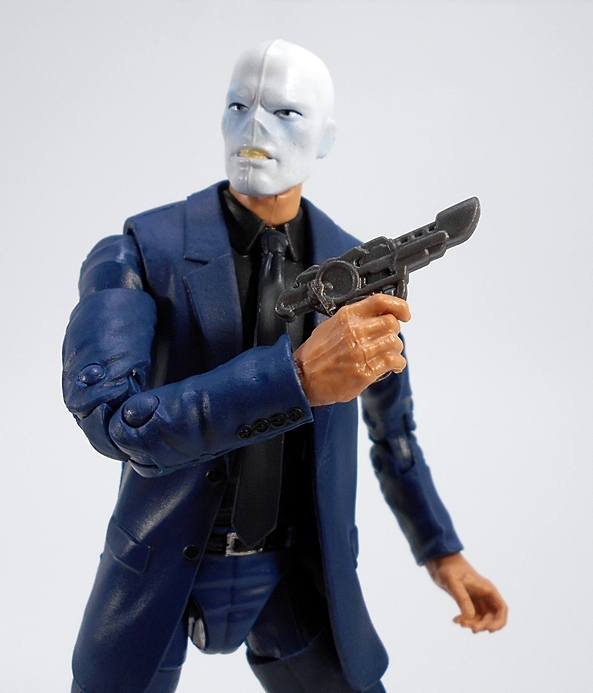 Given the relatively low price of the figure and how much I love the character, I’d be tempted to roll the dice and try again for a figure with better paint at some point down the line. If I get around to doing that, I’ll likely post an Addendum here to report on how I make out. 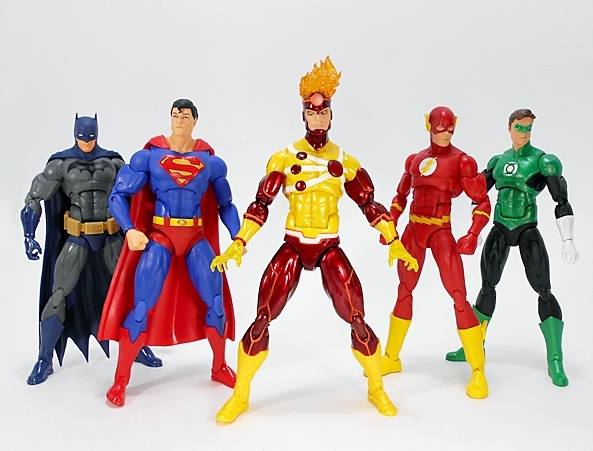 In case you haven’t noticed, 2016’s final wave of DC Icons figures has been trickling onto the pegs. I was able to get The Joker a little early and now I’m working on picking up the rest of this four figure assortment of comic book randomness. 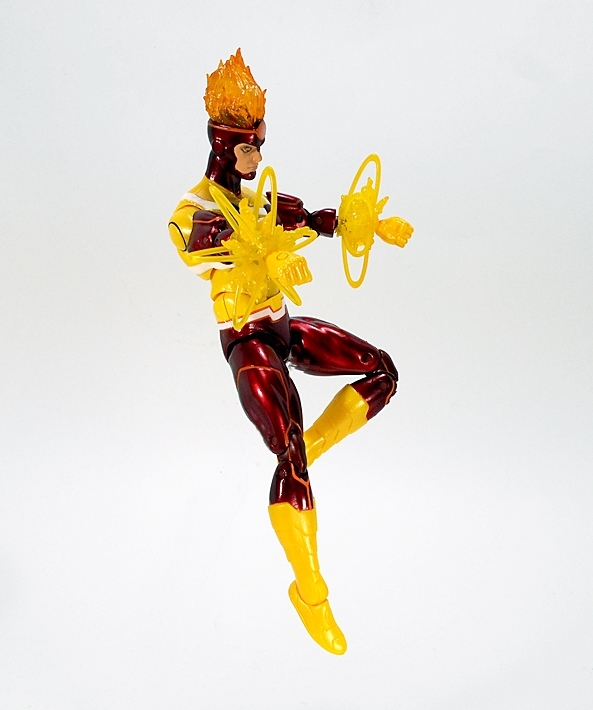 Today I’m checking out the one figure I was looking forward to the most, and a character that still eludes my DC Universe Classics collection… Firestorm! 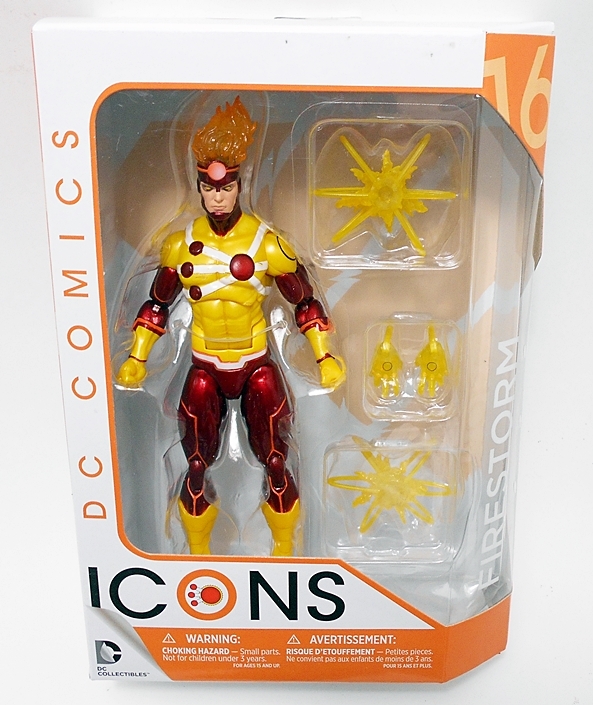 Firestorm comes in the same style packaging we’ve been seeing since the launch of this line. You get a clean and collector friendly window box with the figures name and number on the side panel along with the comic he’s drawn from. 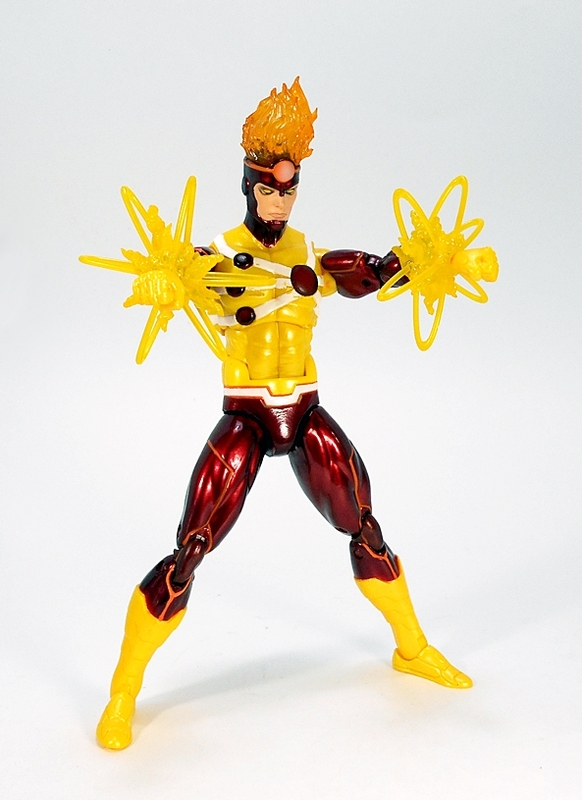 In this case, Firestorm hails from “Trinity War,” his last hurrah before his matrix became a living prison for the Justice League in “Forever Evil.” As always, the package gives you a great look at the figure as well as all of his extra bits and pieces. 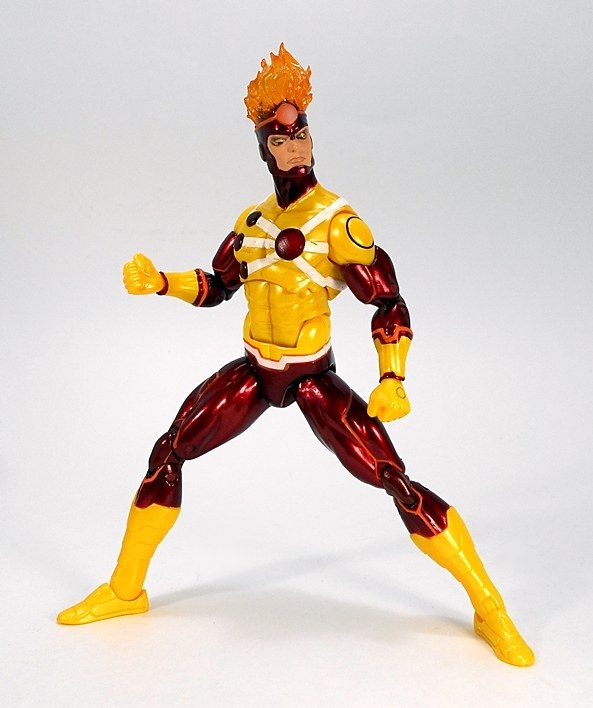 I’ve gone on record many times for holding the rather unpopular opinion of liking most of the New 52 costumes and that holds true for Firestorm here as well. 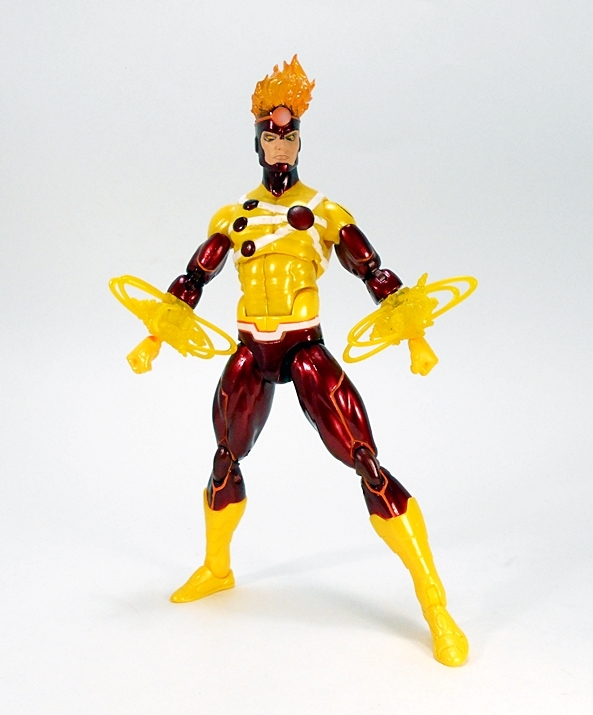 Of course, this costume isn’t a radical change from his more classical looks. As a result, I’m going to guess there aren’t that many people hating on it. 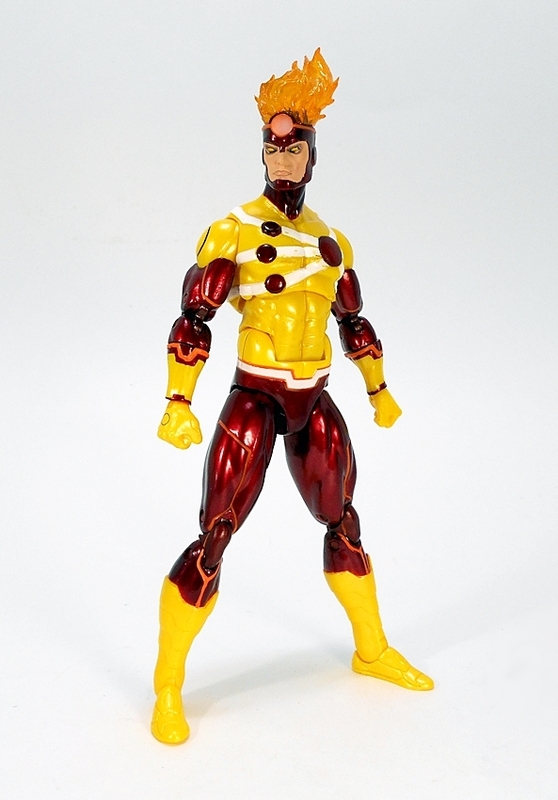 I will concede that I miss the flared shoulders on his older costume, but everything else here works just fine for me. As has been the case, just about every detail on the figure’s costume is part of the sculpt, from the panel lines to the chest emblem. DCC has definitely not been cheaping out on these sculpts by re-using a lot of parts. The coloring on this figure is absolutely fantastic. 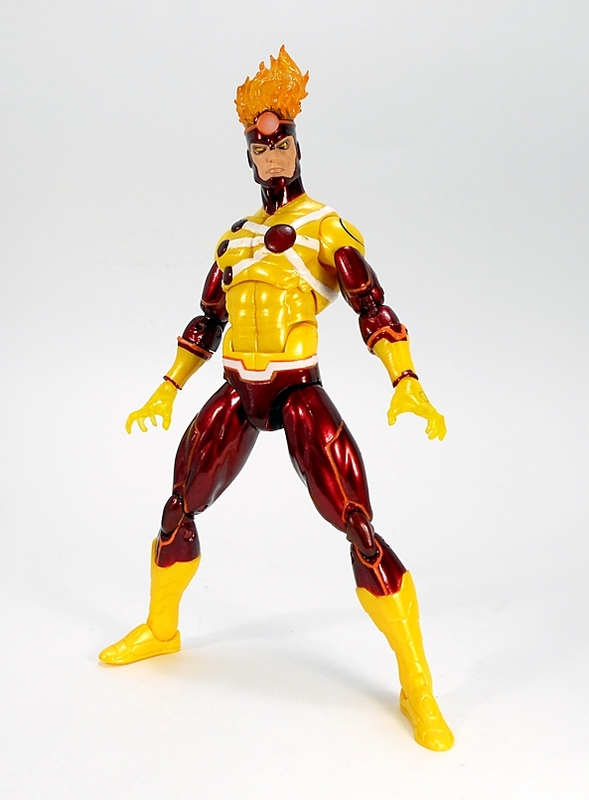 DCC uses a gorgeous, deep metallic crimson for the pants and sleeves and a pearlescent yellow and white for the rest. You also get some neon orange paint in the panel lines. There’s a slight variation between some of the painted yellow bits and the actual yellow plastic, but it’s really not that bad. I particularly dig how they used translucent red plastic discs for his chest emblem and the larger one on the back. On the downside, my figure has some scuffing on his chest, which is pretty unfortunate. These are the pitfalls of having to buy these figures online and sight unseen. From the neck up, things are just fine. 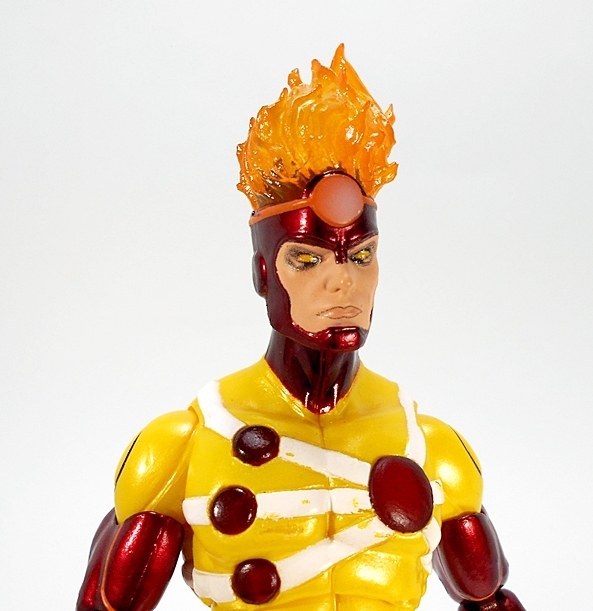 This is one of my favorite portraits in the Icons line so far and the translucent yellow and orange plastic used for his hair/flame effect looks great. You get more of that snazzy metallic crimson for his helmet and the paint lines are pretty crisp and clean. The articulation on this line has remained consistent throughout and there are no changes here. The arms have rotating hinges in the shoulders and wrists, with double hinges in the elbows, and swivels in the biceps and forearms. The legs are ball jointed at the hips, with double hinges in the knees and both hinges and rockers in the ankles. There’s an ab crunch hinge near the waist, a ball joint in the chest, and another ball joint in the neck. Still no thigh swivels, which remains my only gripe about these otherwise excellent figures. 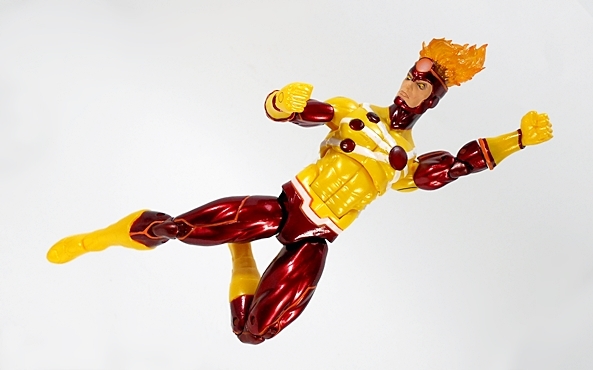 Firestorm includes some pretty spiffy effect parts. 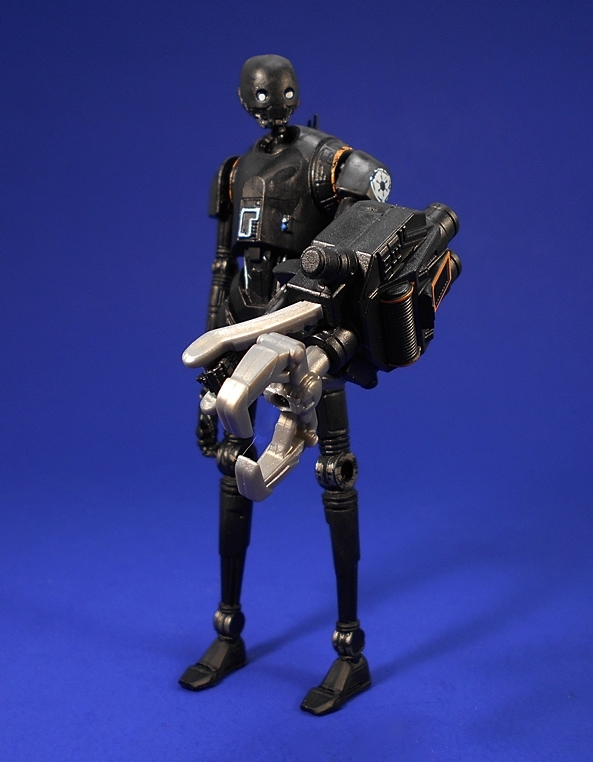 These replace part of his forearms and the hands attach on to the end. I love the look of these and may actually keep them on the figure for everyday display. As someone who is generally pretty indifferent to effect parts, that’s some high praise, folks. You also get an extra pair of hands, which are cast in translucent yellow plastic. 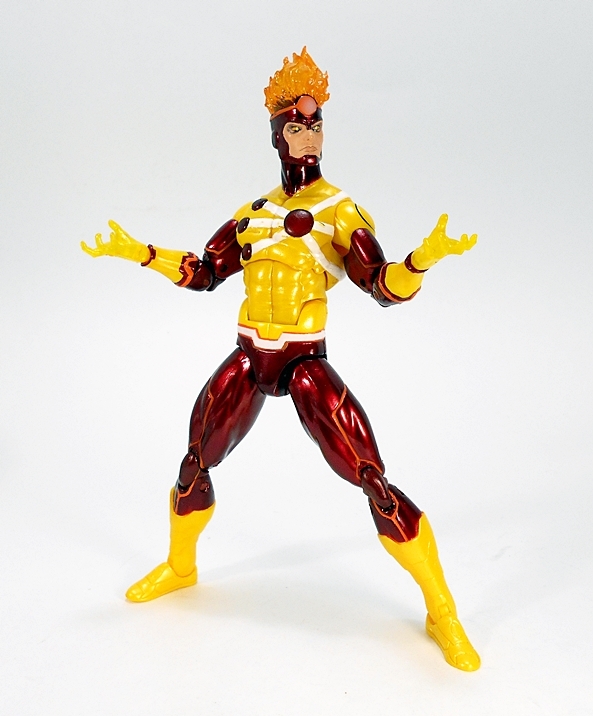 This line continues to scratch that itch left behind by the absence of DC Universe Classics and I find myself excited every time a new wave drops. 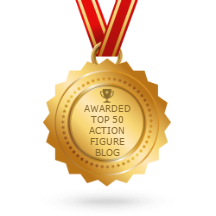 It’s hard to believe we’re at sixteen figures already! 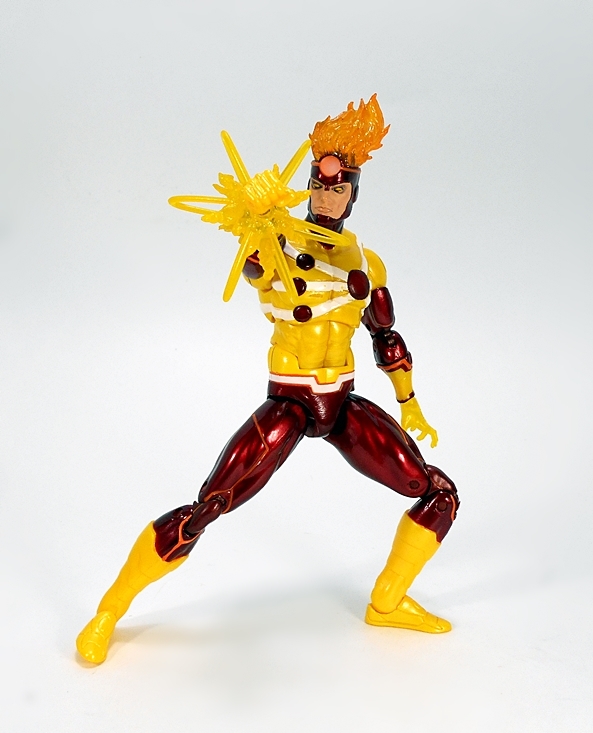 Firestorm and Joker are both high points of this assortment for me, but I’m still on the hunt for Static Shock and Jon Stewart before the end of the year. I don’t want to venture into 2017 behind on my Icons, because it looks like DC Collectibles is going to be putting out a ton of these next year and the pre-orders are already beginning to pile up like crazy! 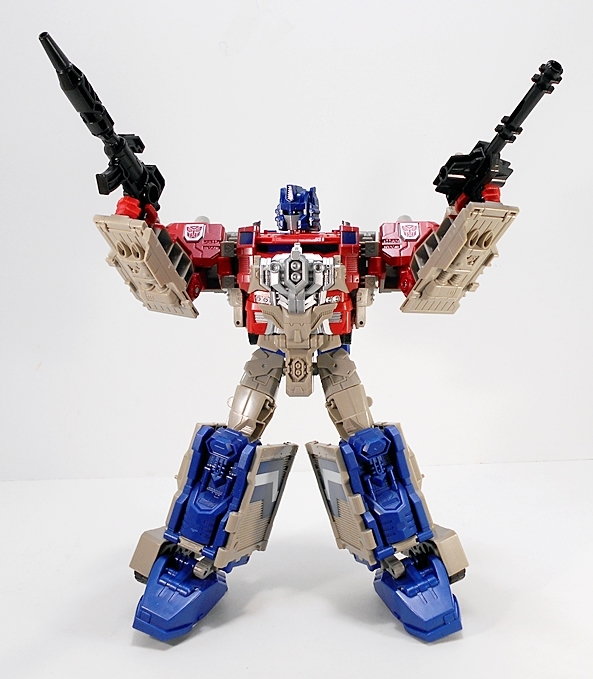 Having been with Transformers since the beginning, you’d think it would be hard for me to name my favorite Optimus Prime toy of all time. Nope. It’s Powermaster Optimus Prime. 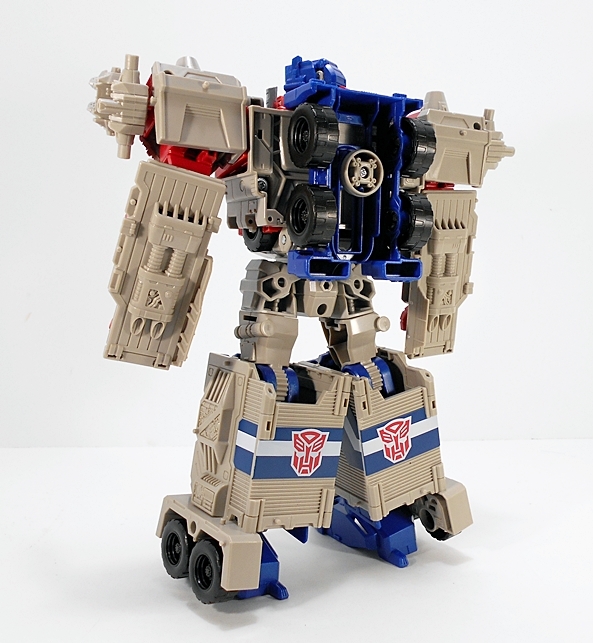 Or, to be more specific, the Commemorative Series Re-Issue of Powermaster Optimus Prime with the Apex Armor. It may not be the best looking or most articulated Prime figure, but in terms of sheer fun, it can’t be beat. 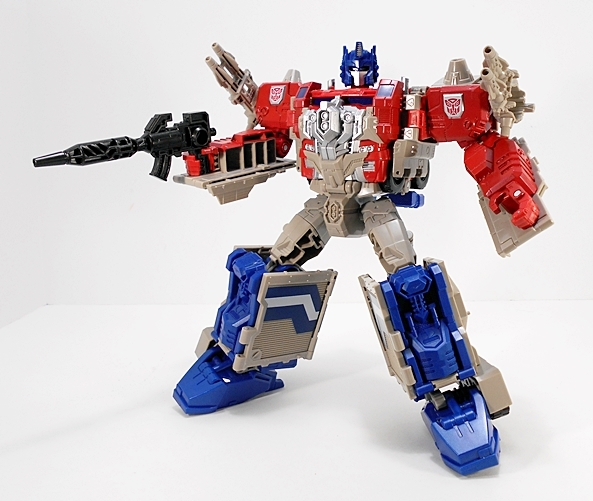 Can you even imagine my delight when Hasbro decided to take an crack at updating that toy with a Leader Class Titans Return release? I’ve pretty damn excited, so let’s jump right in and check this big guy out! This is my first boxed figure from the Titans Return line, but it’s not all that different from the Leader Class Combiner Wars boxes. 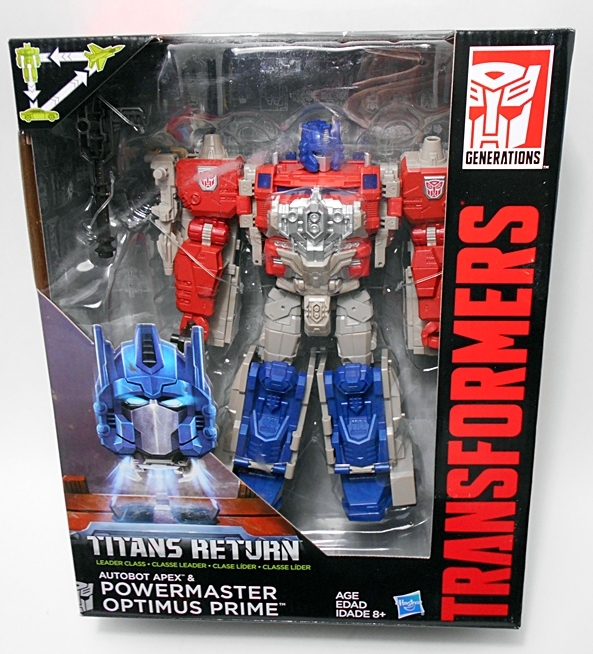 I don’t have a lot to say about the packaging, other than it is collector friendly and Prime comes in his robot mode. The top corner points out that he’s a Triple Changer, but the third mode only refers to his base mode. Thank Primus for that. I’m probably going to wind up passing on the Voyager Class G2 Prime because I don’t want my Prime’s having a third jet mode. Anyway, I’m going to start with his vehicle mode, then jump to his base mode, and end up with the robot. 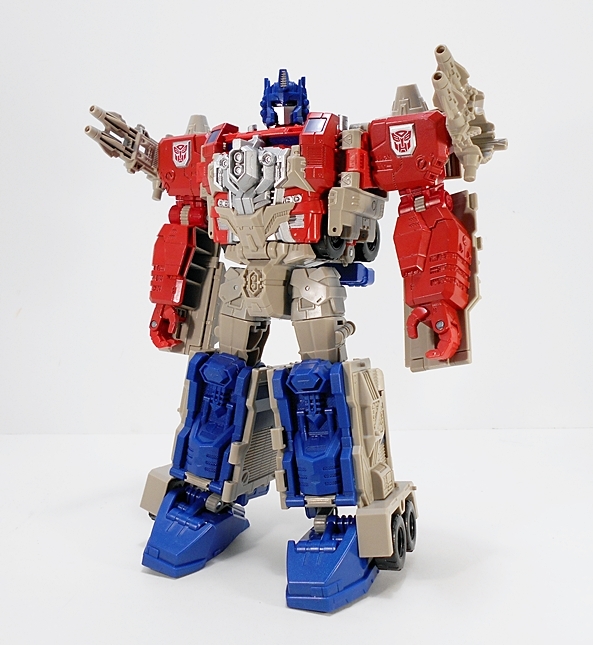 It’s worth stressing that this toy is mostly an homage to the original Hasbro release of Powermaster Prime and doesn’t include the Apex Armor found in the Commemorative release. Yeah, it’s the Apex Armor that makes me love that toy so much, but I still have high hopes for this one. 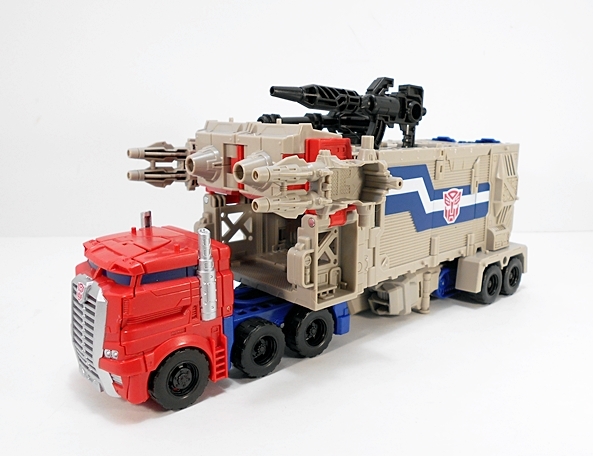 In keeping with the original toy, Prime’s alt mode is his original truck mode only beefed up into a sort of battle wagon. The whole thing is a little more compact than the original toy’s alt mode, but I think they handled the design pretty well. 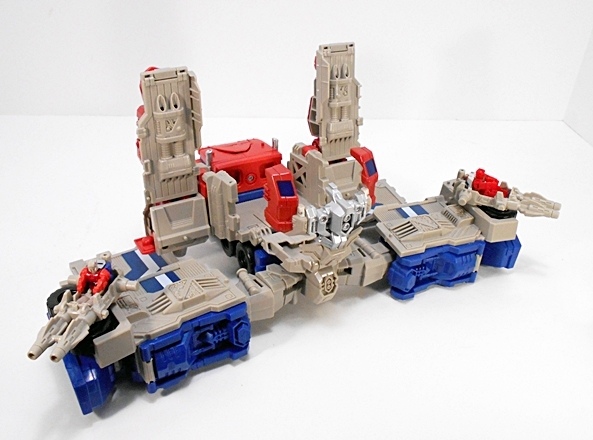 Doubly so, when you take into account that this toy is remolded from the CW Ultra Magnus figure. The base plastic used for the trailer is closer to tan than the gray used for the original toy, but I think it still looks pretty good. 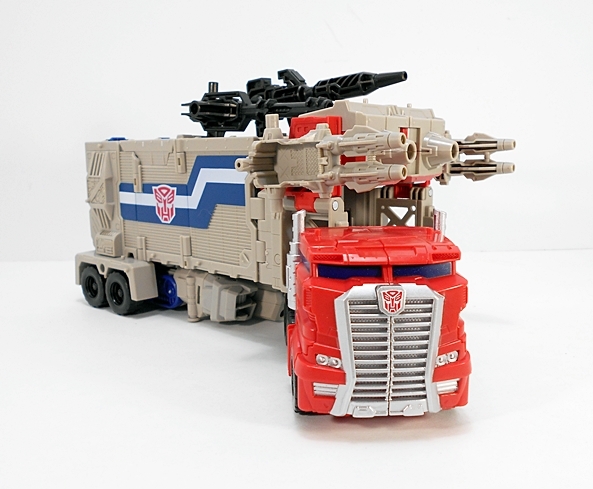 The jagged blue and white stripes and Autobot emblems on the sides of the trailer are instantly familiar as are the double barrel guns on the front corners of the trailer. You also get all sorts of texturing and sculpted detail all over the toy. This thing is great! The cab is the biggest departure from the original toy. 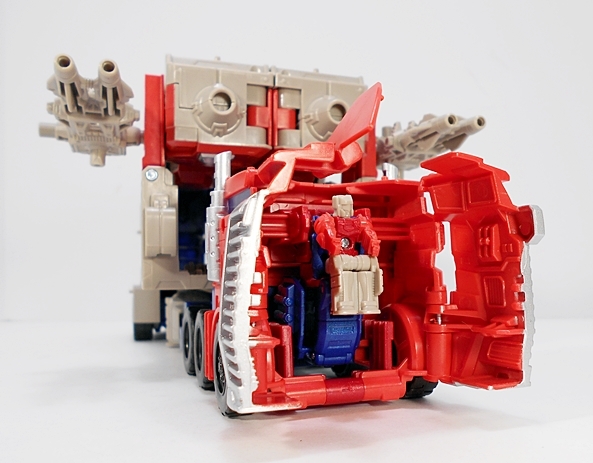 G1 Powermaster Prime’s cab was fairly close to his regular G1 cab, whereas this one looks like a beefed up, armored version, thanks to the narrow window slits and the prominent grill. The coloring on the cab is also very nice. The red plastic is bright and vibrant and the silver paint used for the grill, pipes, and other accents looks fabulous. The deco is rounded out with some blue. 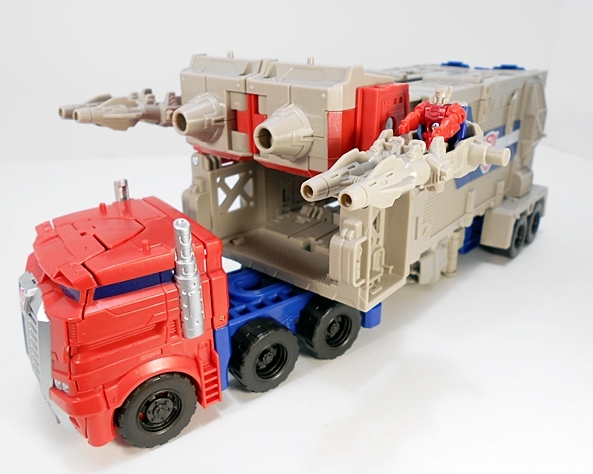 The cab does pivot where it links to the trailer, but it’s also permanently attached, so unlike the old Powermaster Prime, this toy has no independent transforming cab mode. 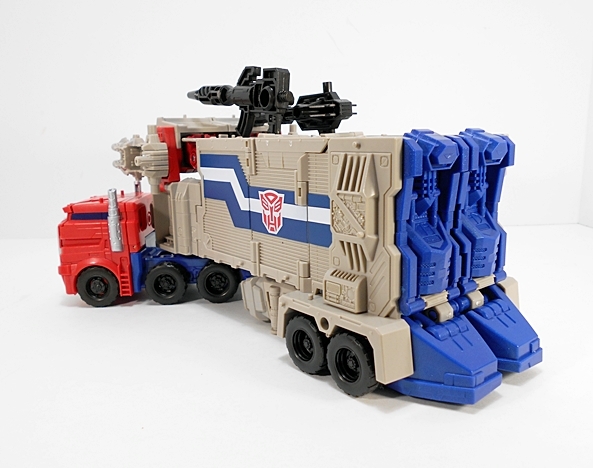 The trailer is basically a hollow shell, which makes sense when you consider that this toy started life as Ultra Magnus. The tail gate can drop down to form a ramp and you can indeed drive a Deluxe car into him. 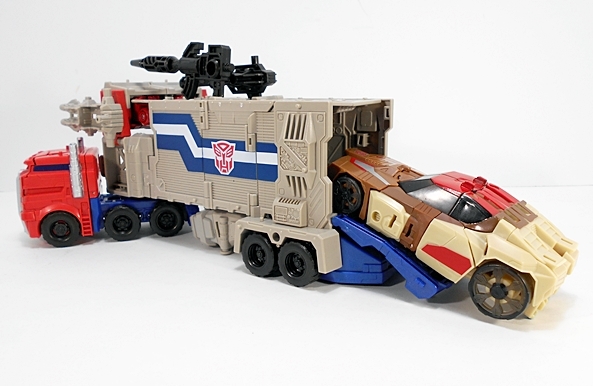 I tested it out with Chromedome and while it’s a tight fit, he will fit inside and allow you to button up the tail gate. The base mode is what it is… mostly a mis-transformed mess. I’m not a huge fan of these, but I understand that they can add a lot of play value for the kids and at least they give you playsets to use all your little Titan Masters with. In this case, you have a control area in the middle, a couple of towers on each side and ramps leading up to the two gunner stations. 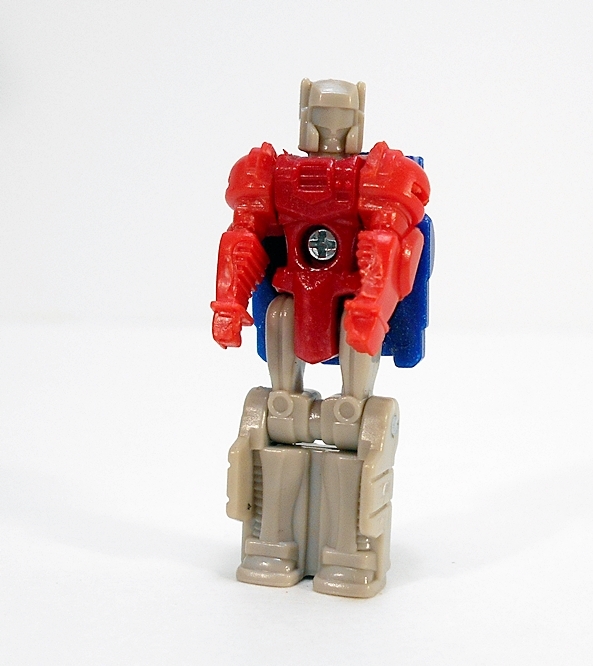 It’s OK, but I think the base mode for the G1 Powermaster Prime was a little better. As I already mentioned Prime’s cab doesn’t feature an independent robot mode, so this toy jumps straight to the big and beefy Prime robot mode, and I absolutely adore this guy. 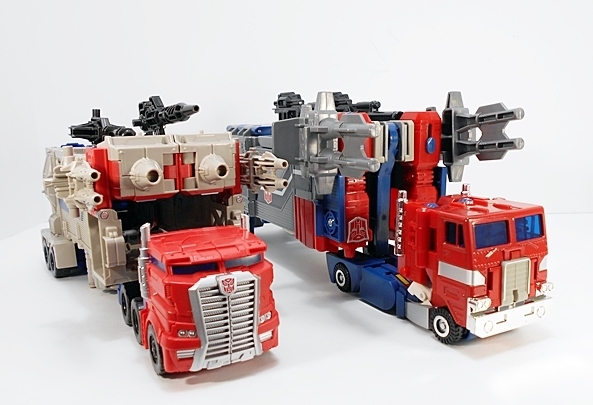 There’s some really clever stuff here, like the way the trailer panels wrap around to fill out his legs and the torso still looks like it’s something you plug the cab into, even though it’s all an integral part of the transformation. 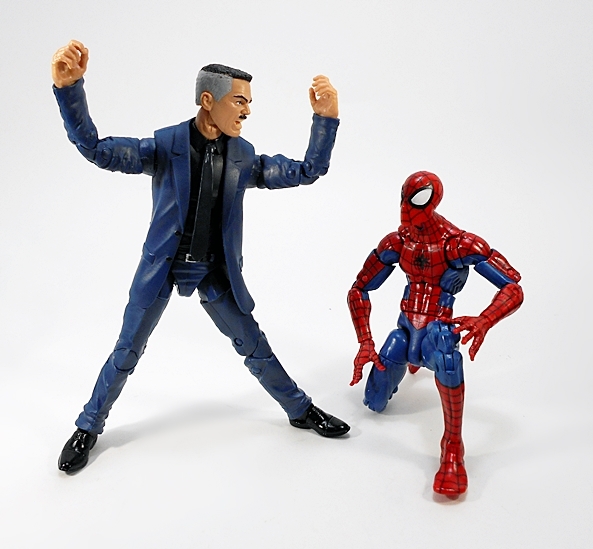 He’s a lot better proportioned than the old toy and he obviously features better articulation as well. The coloring is still plenty nice, even if it is missing some of the paint pictured on the box images. He even looks pretty good from the back. You get a little cab kibble, but for the most part everything else is just solid plates. I really wish he had some lateral rockers in those ankles, though. He’s perfectly stable as he is, but it would have made the wide stances look a lot better. 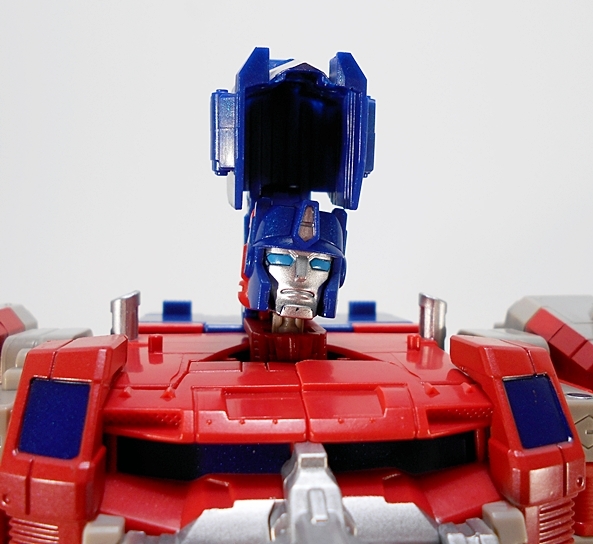 The Headmaster gimmick here is a little strange in that Apex transforms into a head that sits inside Prime’s head. It’s sort of like what we saw with Voyager Galvatron, only much, much better. Apex’s head mode looks a lot like an Orion Pax homage, although maybe they were going for something like the Apex robot mode from the G1 toy. 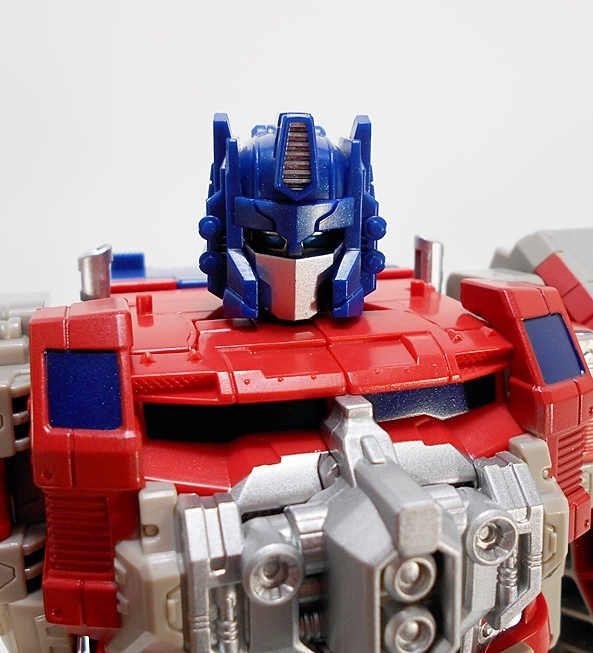 Either way, once you close down the Prime head, the only thing that shows through from Apex are the eyes and while they are deep set, I think they look fine. The head still turns, so I’ve got no problems with any of this. The two black guns that mount on Prime’s trailer become his rifles in robot mode and the others peg into his shoulders. While Prime’s hands are hinged, there are also tab slots in the plate under his hands that the gun handles will plug into. Closing the fingers around the grip make it look like he’s holding them, but you’re also getting that added degree of stability, which is nice. 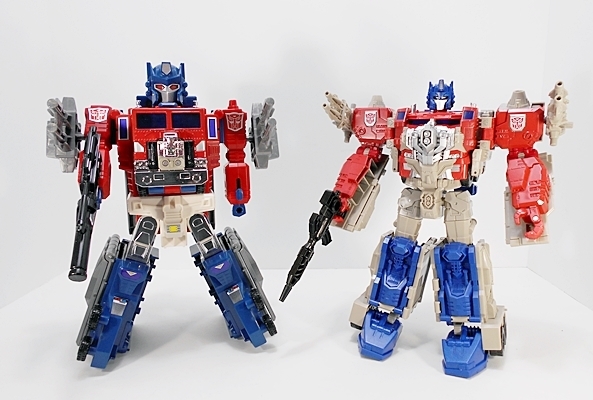 I’ll freely admit that I’m biased when it comes to this Powermaster Prime homage. I love the original so much and this release is such a wonderful love letter to that toy. He looks great, he’s surprisingly quick and easy to transform, and he’s so much fun to play with. He also scales nicely with the Combiner Wars Leader Class figures, so I finally have a Prime that can stand up to that Megatron. Never in a million years would I have guessed Hasbro would give us something like this and yet here it is, proudly standing on my desk. 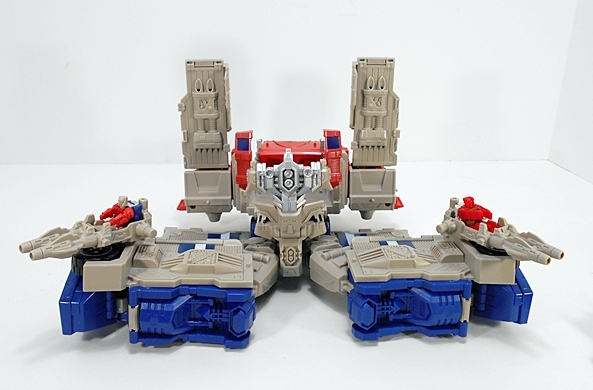 For budgetary reasons, I decided that I was going to go Hasbro straight down the board for Titans Return, but I love this toy so much, I’m tempted to double dip and spring for the Takara version when its released. 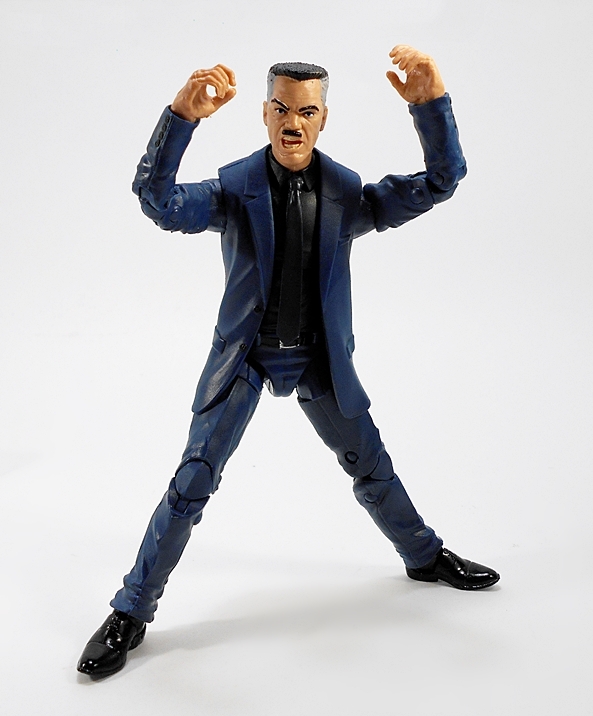 It’s just one of those figures where I need to know that I own the best possible version of the mold. 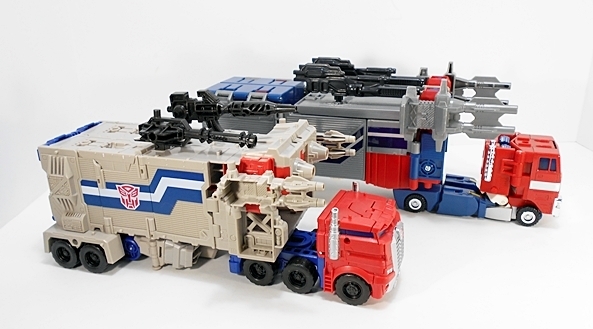 I’m also seriously considering going back and grabbing that Ultra Magnus, just so I can appreciate this toy even more.